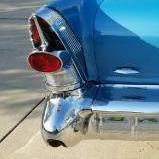 Heads up........Those big ole 58 tail lamp housings use only the two long studs as the ground to the body. I will agree with you there Roadmaster75. 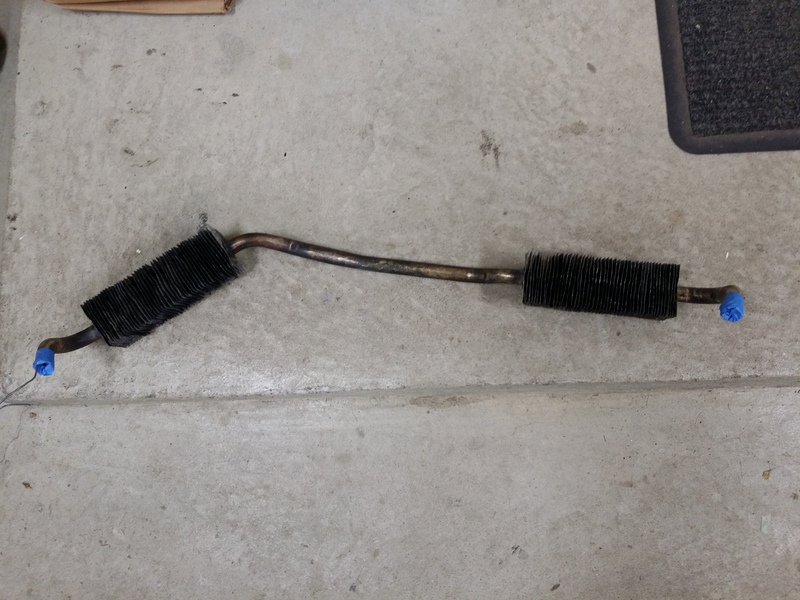 My Special was giving me issues with the right rear stop / tail light and realised eventually the top bolt was allowing the housing to move which meant the ground wasn't all that good. 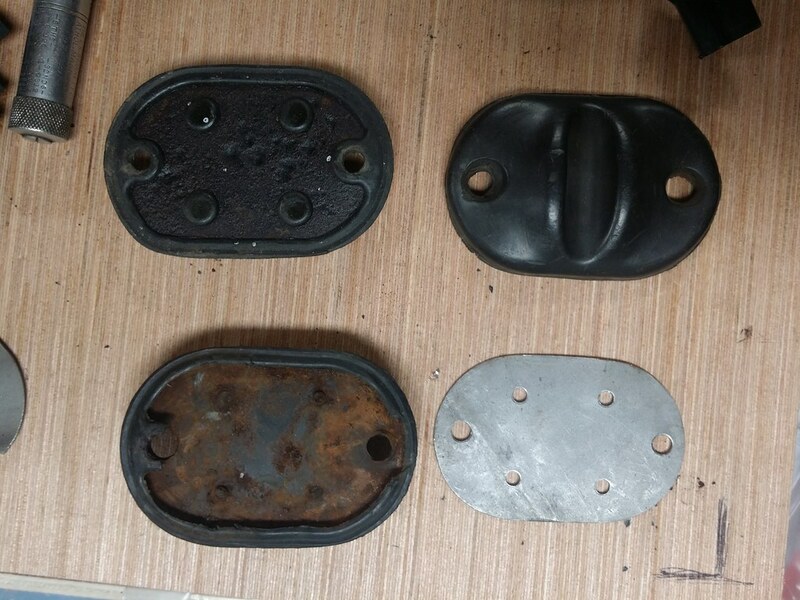 Sitting for 13 years obviously meant there was likely some corrosion too so removed the housing, cleaned the studs and reinstalled it which made the difference. I didn't do like you and put in an extra ground wire but will figure if it happens again, know what to do. 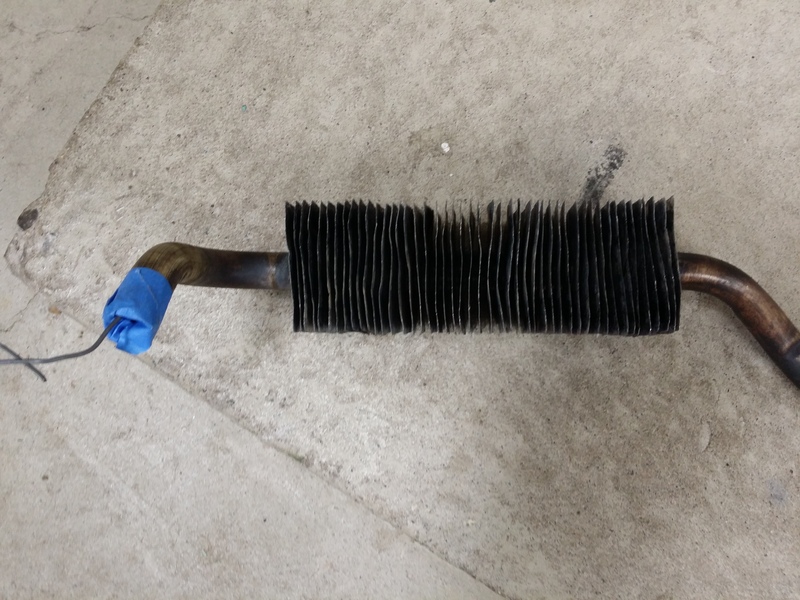 I know Joe has posted grounding things under the dash from reading this great thread of his but with all the detailed work he has been accomplishing your advise might be timely (if he has not already done this). Can't wait to see the "Long Roof" at her first show! I add dedicated grounds to tail lights and other circuits on all my project cars. Been doing it for many years. 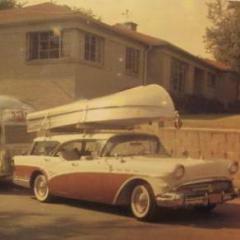 My initiation into the joys of intermittent grounds was with a 1957 Corvette, back in the early '80s. 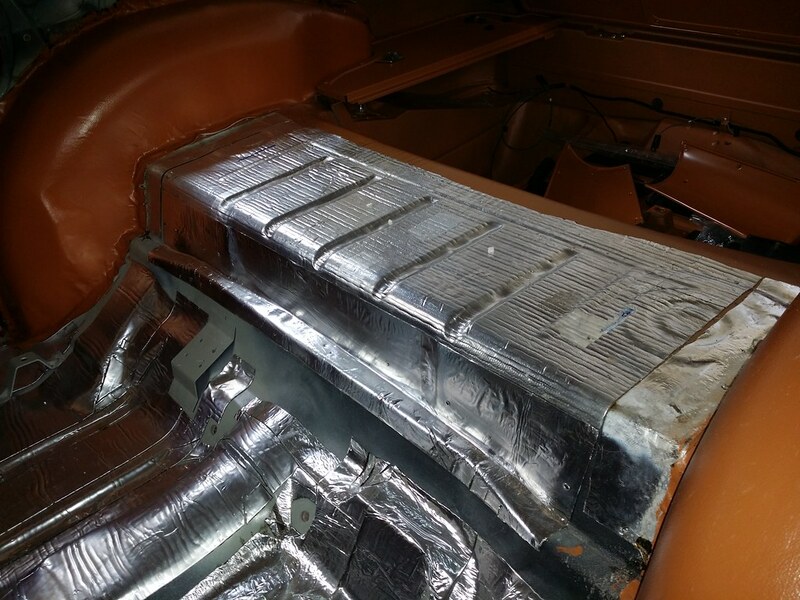 On this car, I installed new sockets in the housings and I used the 3-wire style, with a dedicated ground wire. 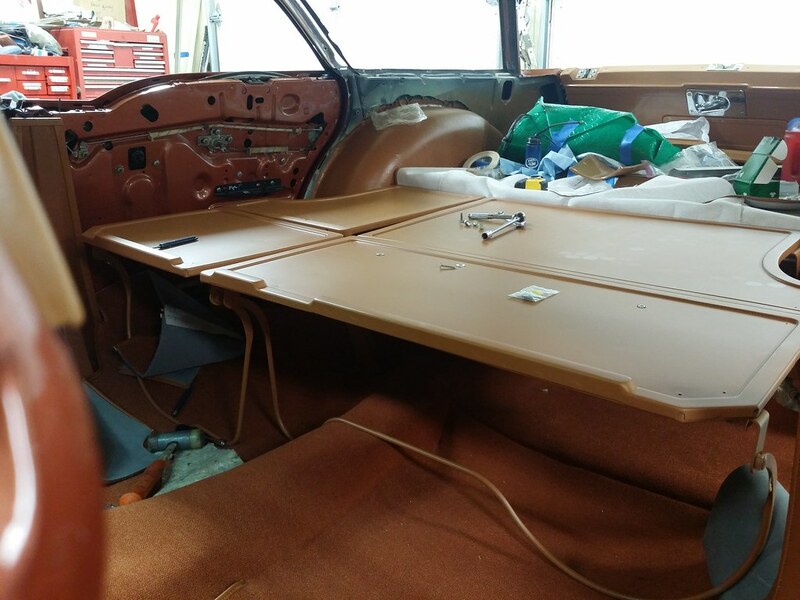 The grounds are being added to all the rear lights and are attached to the inner structure of the body, under the load floor. 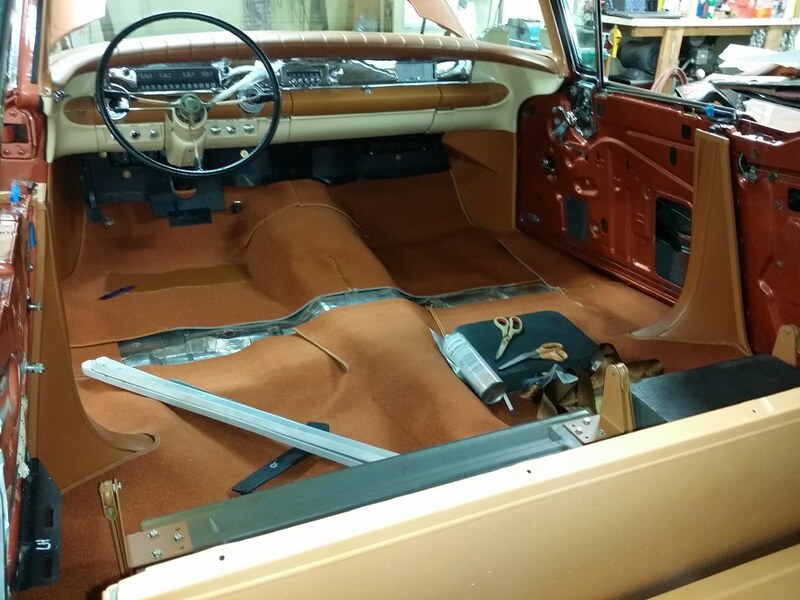 Your efforts with detail to this point are surpassed by the talent you exhibit with this interior work! She clearly is going to be an award winner! Thanks for the kind words, sebastienbuick & dei. 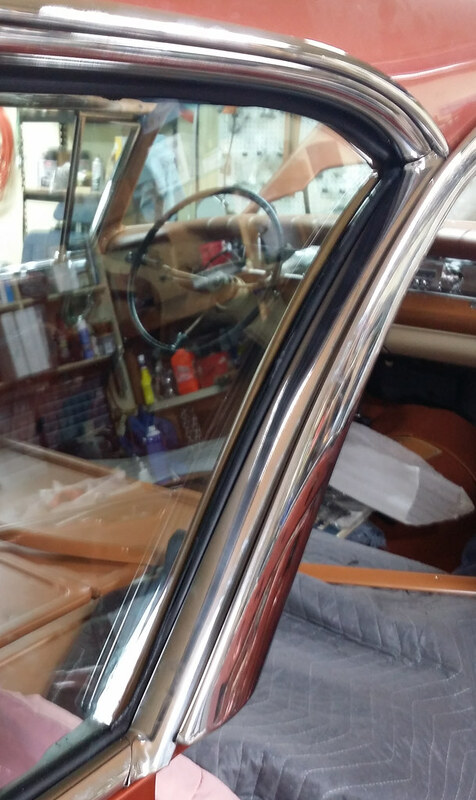 This car will be better than new...incredible! I think I'd be afraid to drive it when done! Congratulations for this great job, I am very admiring . Joe, your patience and attention to detail is outstanding. 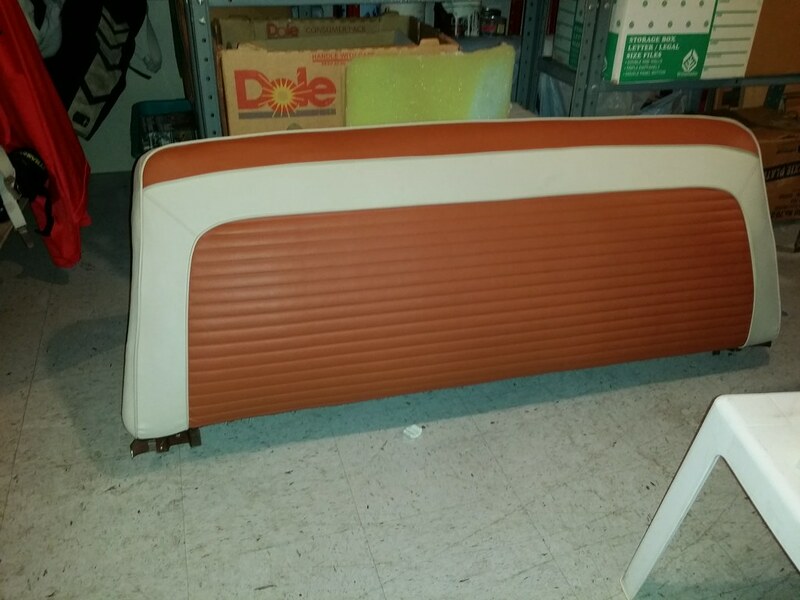 The work on those heater fins pretty much sums it up! 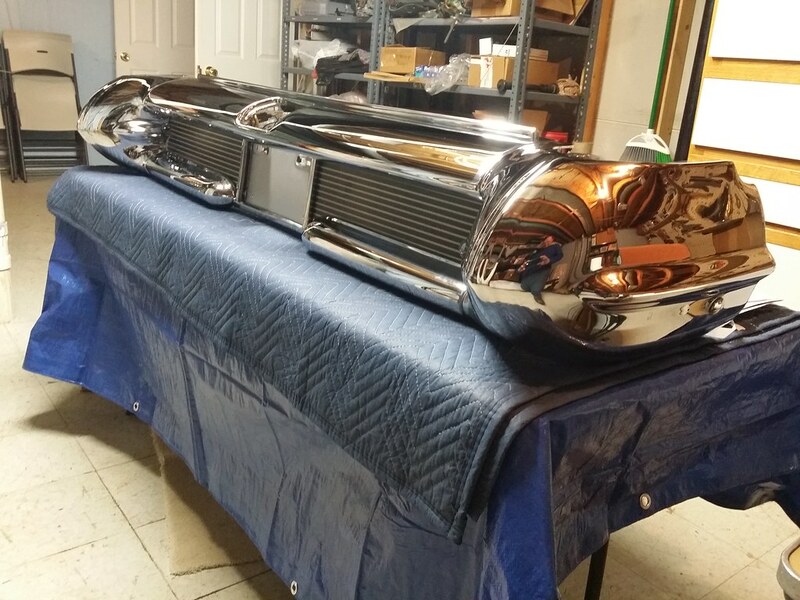 It's time to start assembling the rear bumper. 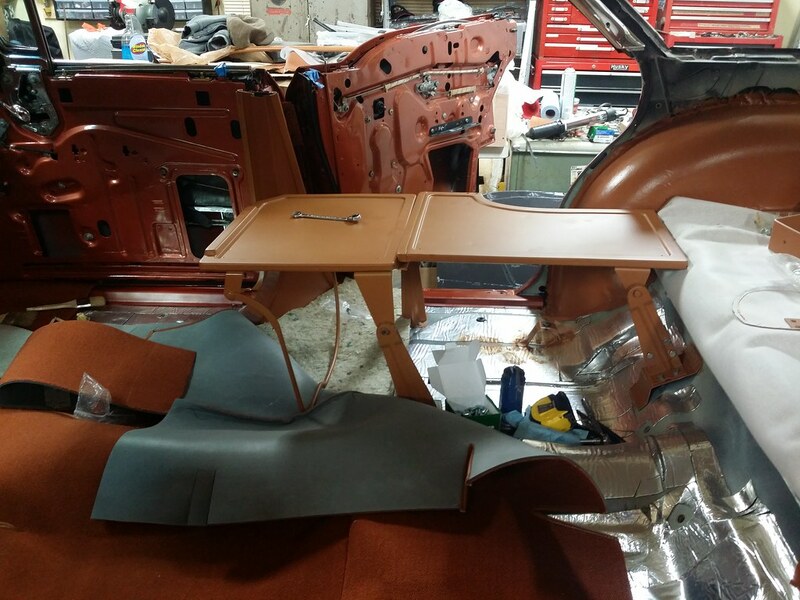 The brackets, ends and center panel go together first. Ready for installation...by 4 of us. Two holders, 2 of us installing bolts. 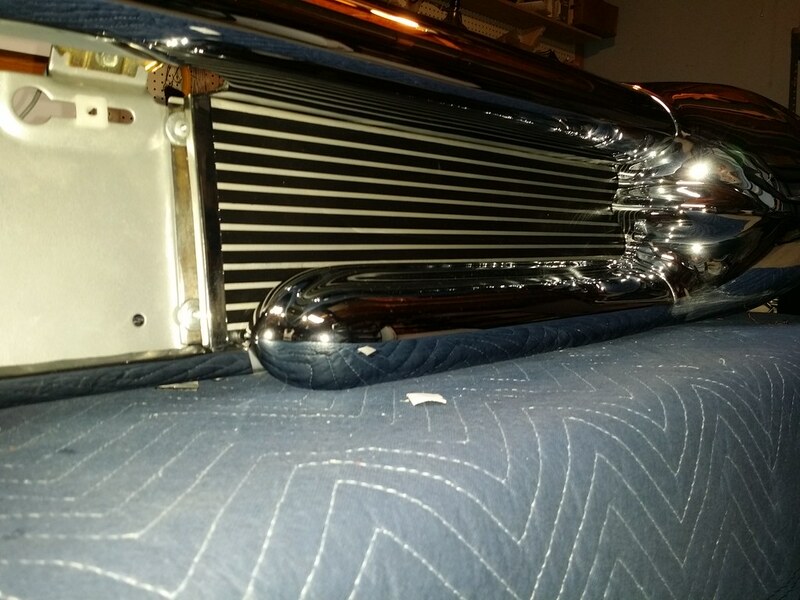 The rear bumper will be one of the last parts I install. 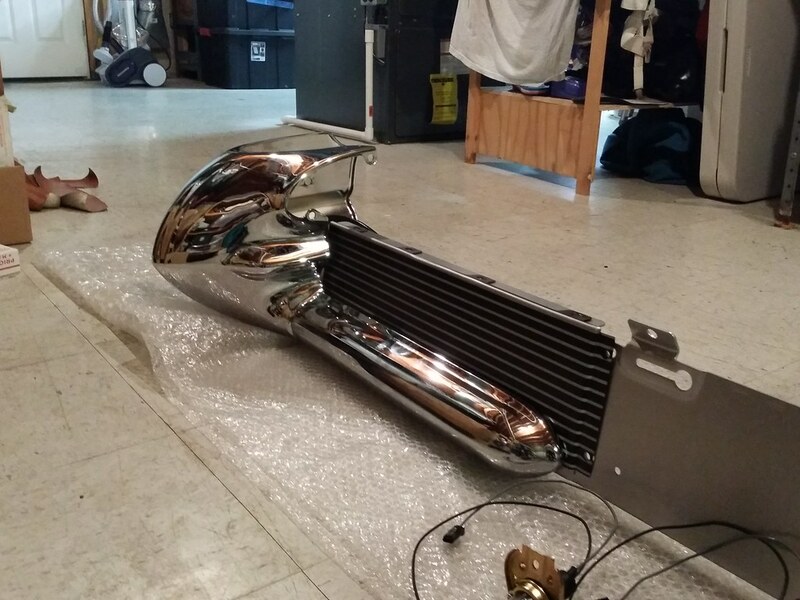 Once it's on the car, it will be difficult to get around the vehicle in my garage! 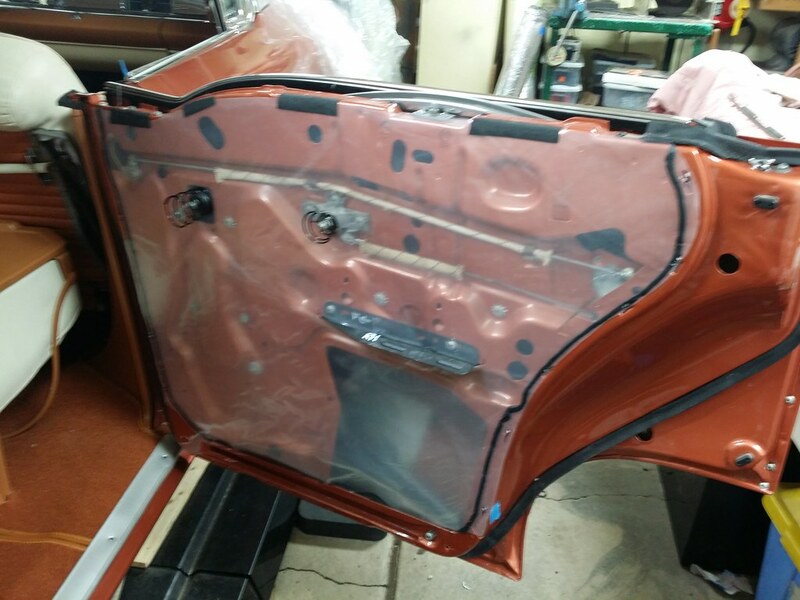 When I test-fit the rear door trim panel, it was too large for the opening and the attaching "nails" didn't line up with the holes in the inner panel. 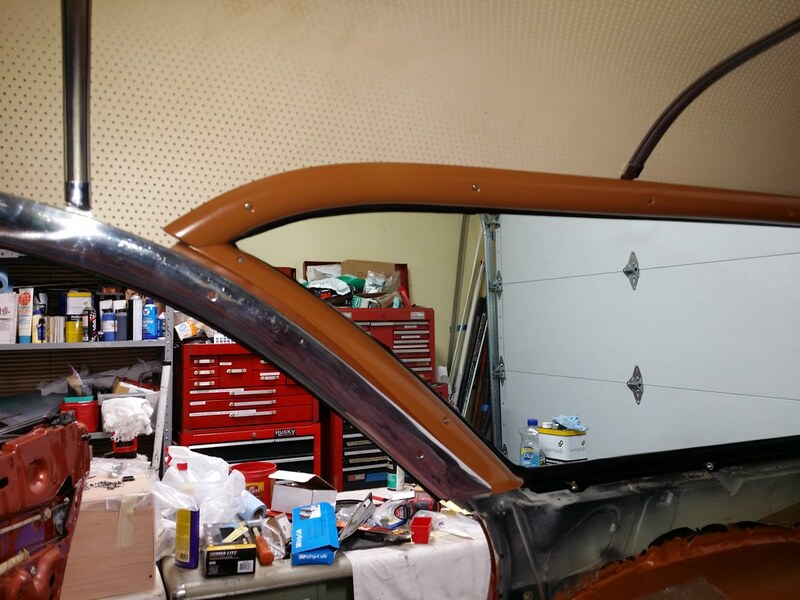 Compared the right and left trim panels and developed a new pattern to fit the rear door. I made sure the pattern fit both the left and right door. Comparing it to the panels I made, I found that I had made a couple of errors. 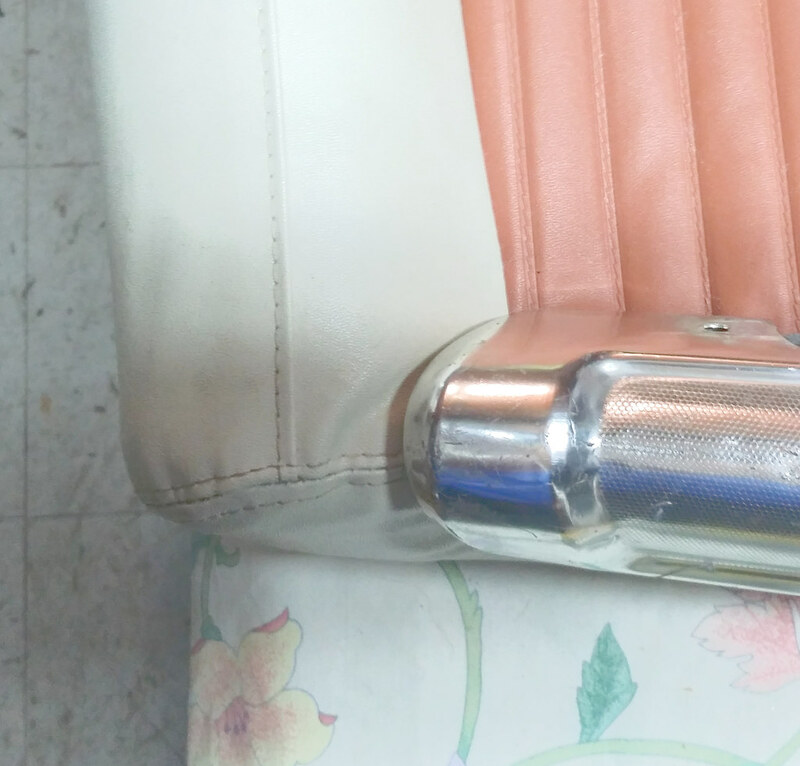 I had cut the armrest bracket mounting hole about 1/4" too low on the panel and I had made the perimeter about 1/8" too large all around the panel. 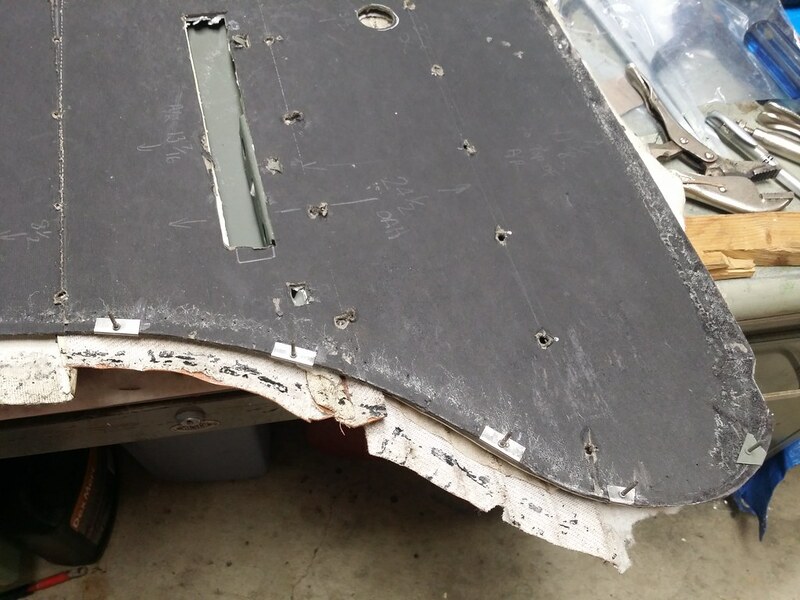 I re-trimmed the perimeter of the panel to fit the door opening with adequate clearance and re-cut the armrest bracket opening. 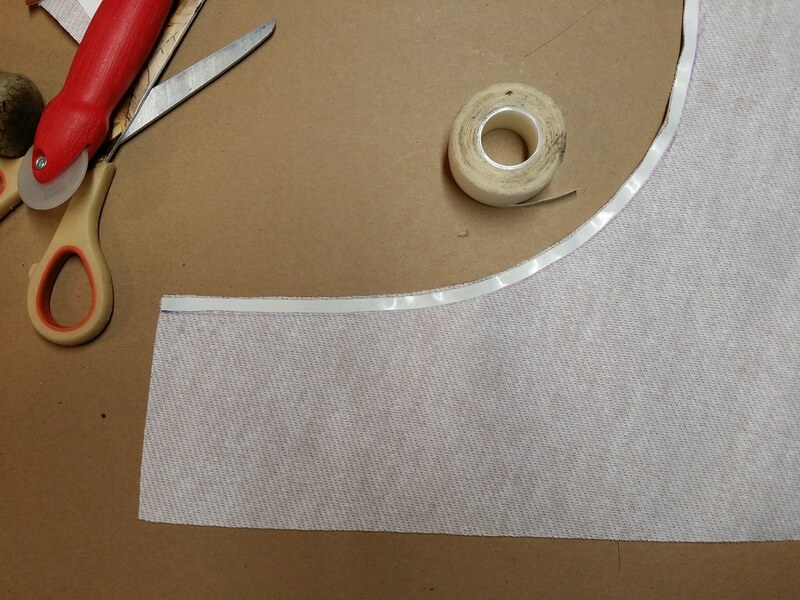 Then, I used the new pattern to accurately position the attaching nails around the perimeter of the panel. 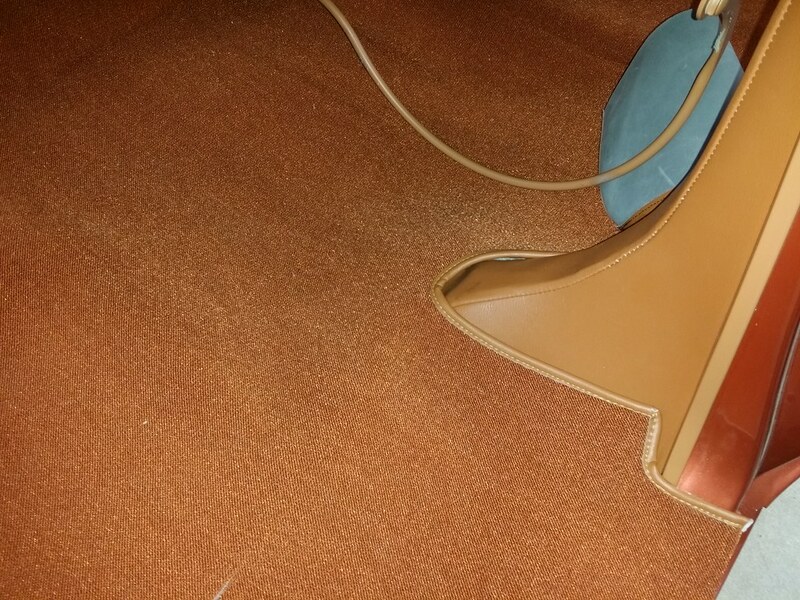 The second test fit was much better than the first. 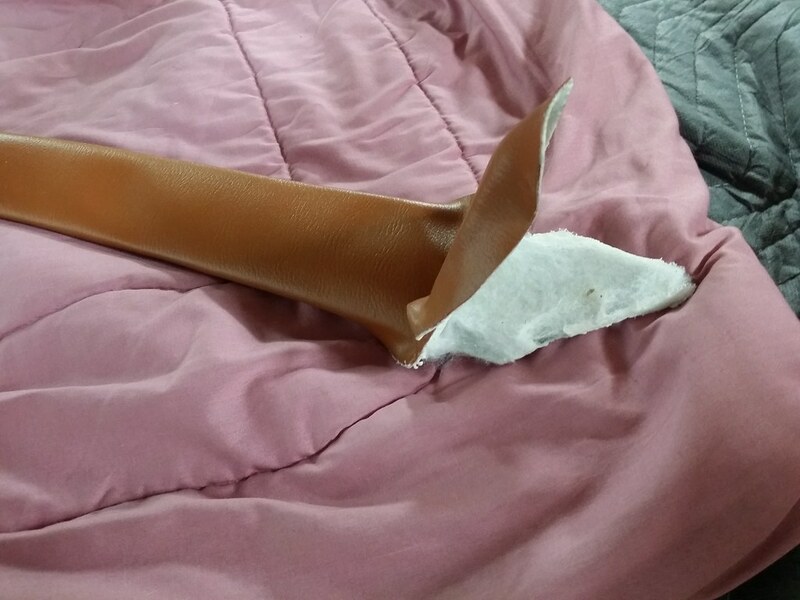 With the nails re-located, I edgefolded the part and tested it again. Here's the panel with the upper moldings attached. 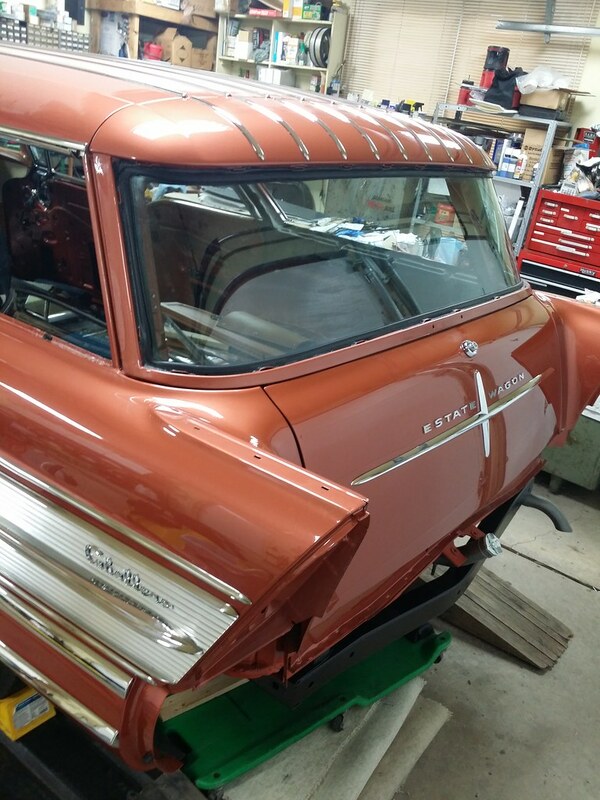 It still needs the lower molding and the "Century" emblem added before installation. 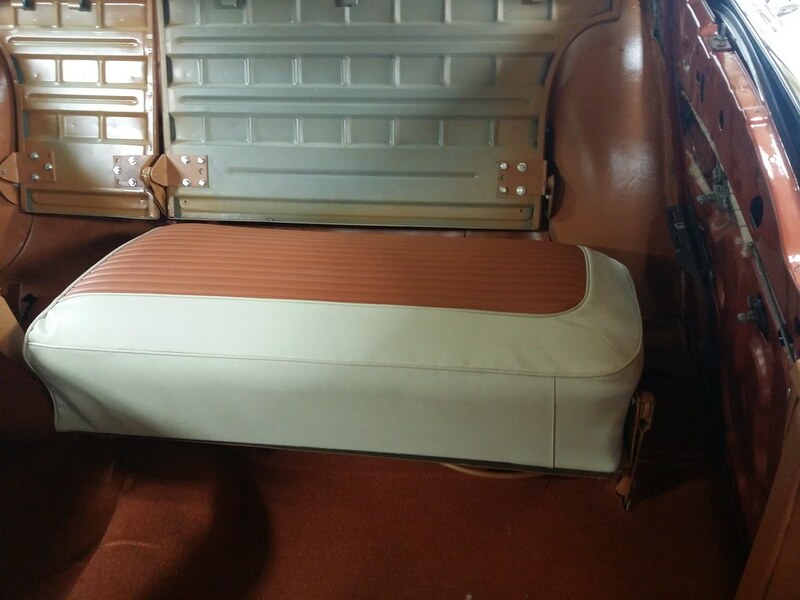 With the rear seat structure in place, I could install the floor-mounted rubber retainers that hold the "legs" of the seat cushions in position on the floor. I have 3 of these for the car. 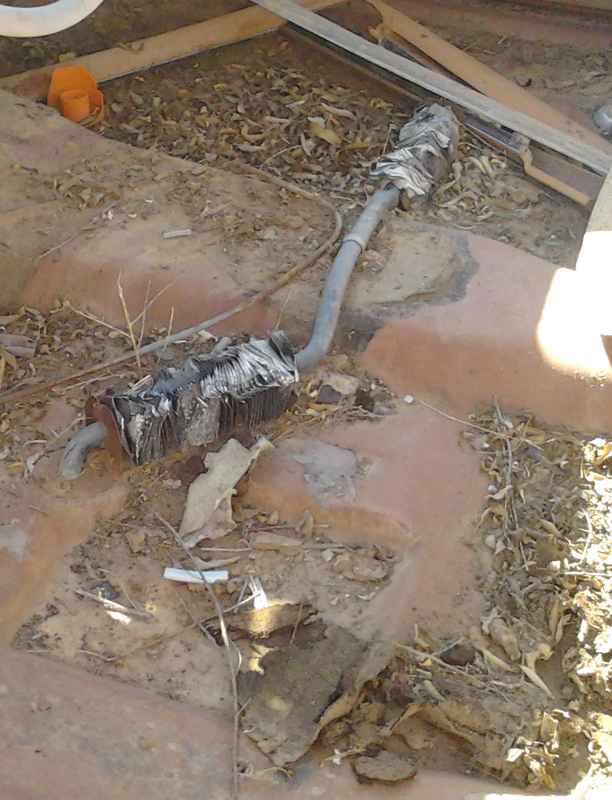 One is in useable condition, but 2 of then have badly corroded metal reinforcements. 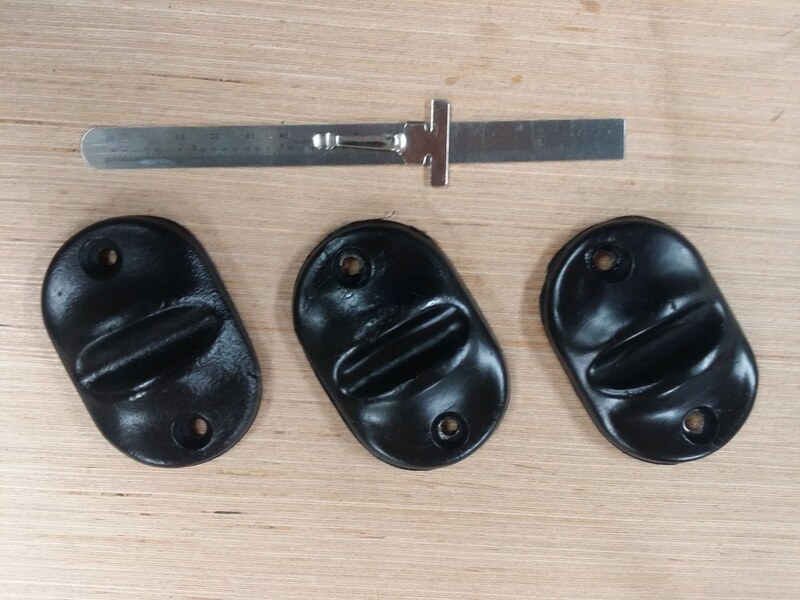 These parts were manufactured by molding a hard, black rubber material directly to the steel reinforcements. 4. 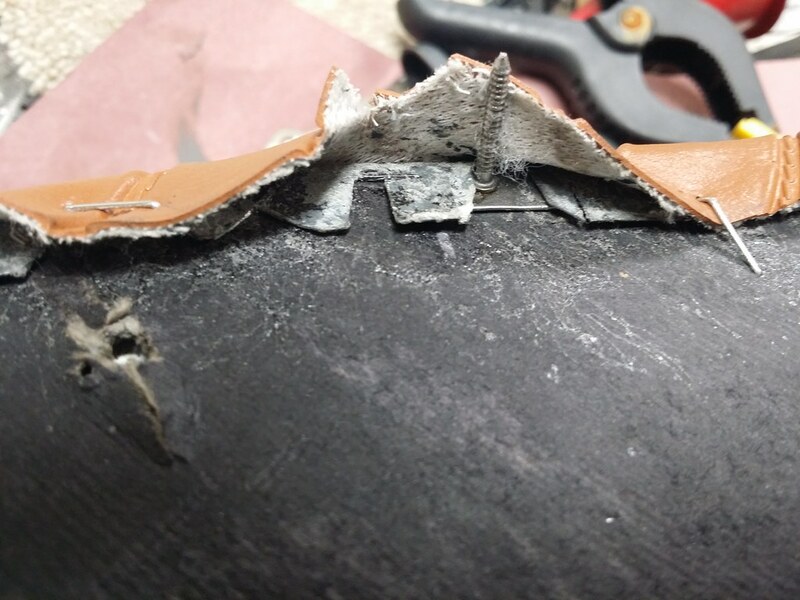 Underside of molded rubber, after removing steel reinforcement. 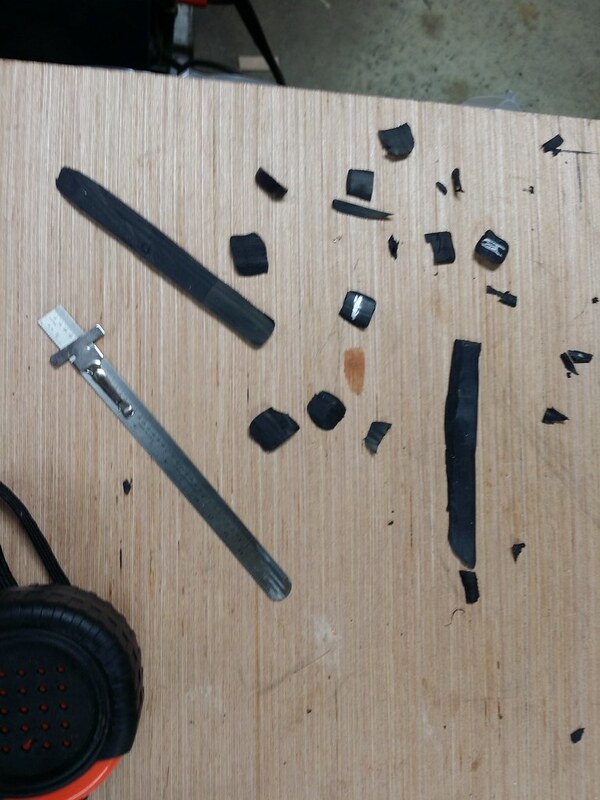 I removed all the dirt and corroded metal from the rubber parts and bonded the new, steel reinforcements to the underside of the rubber with a urethane adhesive. 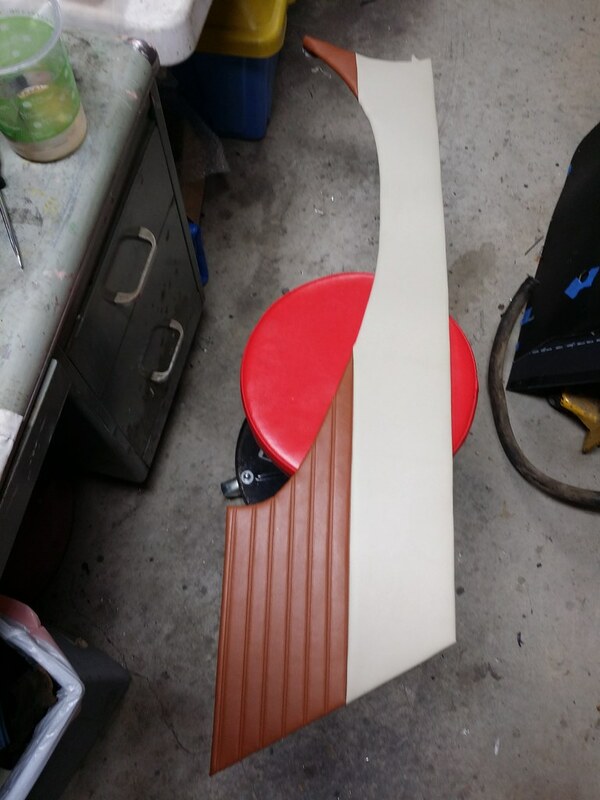 I had to delay making the quarter trim panels until the rear door trim panels were finalized. 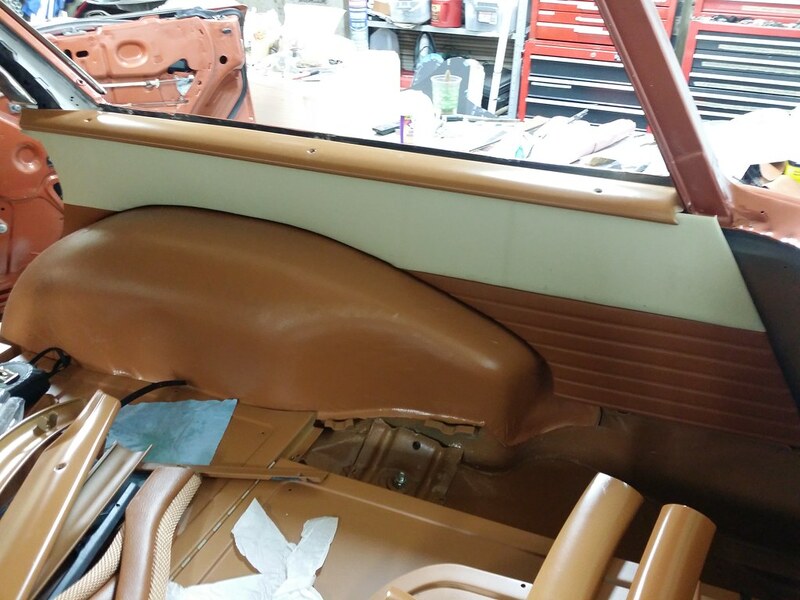 The two-tone split line on the quarter trim should align with the 2-tone line on the doors, so I had to confirm that location before making the quarter trim. 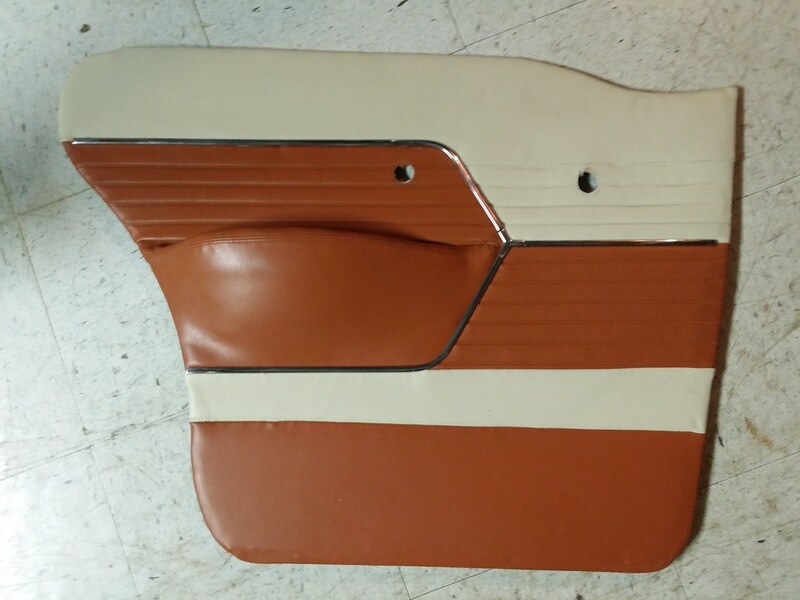 I marked the location of the 2-tone split on the rear of the rear door opening and used that to finalize the trim patterns for the quarter. 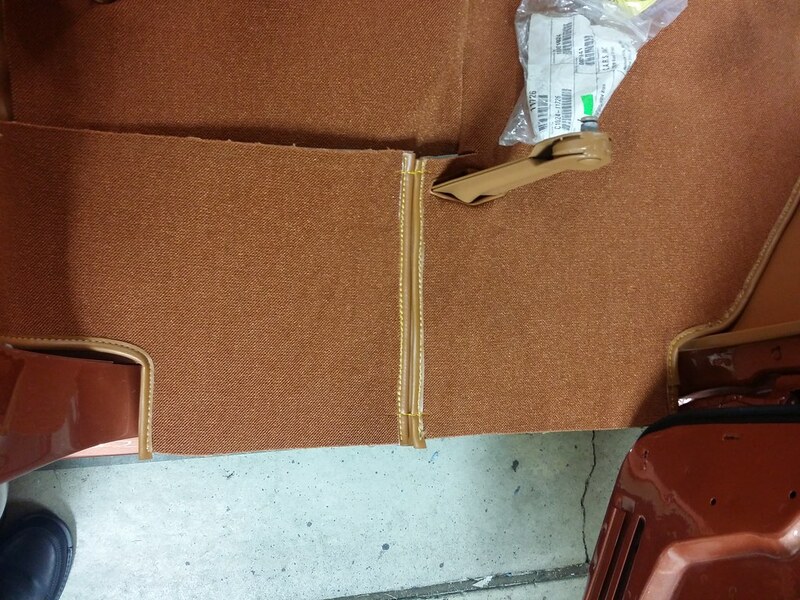 This is the preliminary assembly of the quarter trim, for mock-up in the car. I still need to add one decorative stitch line, above the color split. 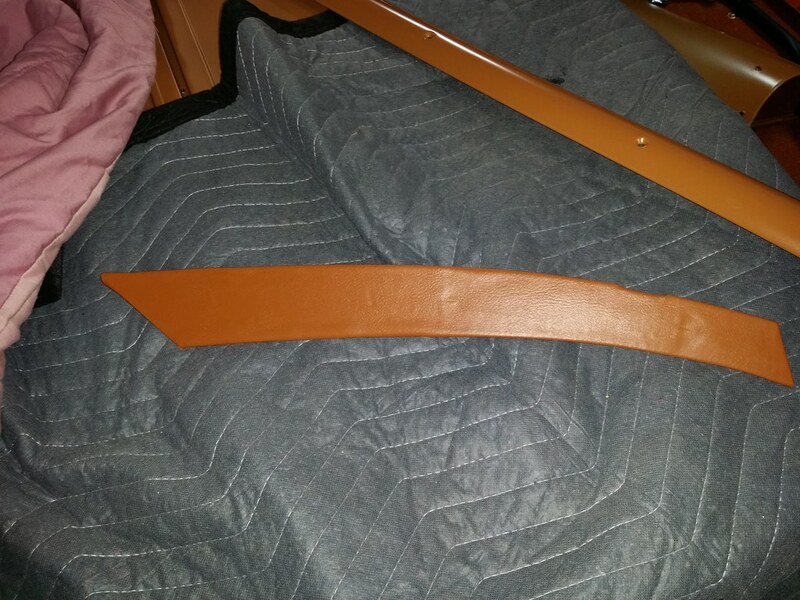 Just waiting for my friend to wrap up the seat covers so I can use the proper color thread for these pieces. 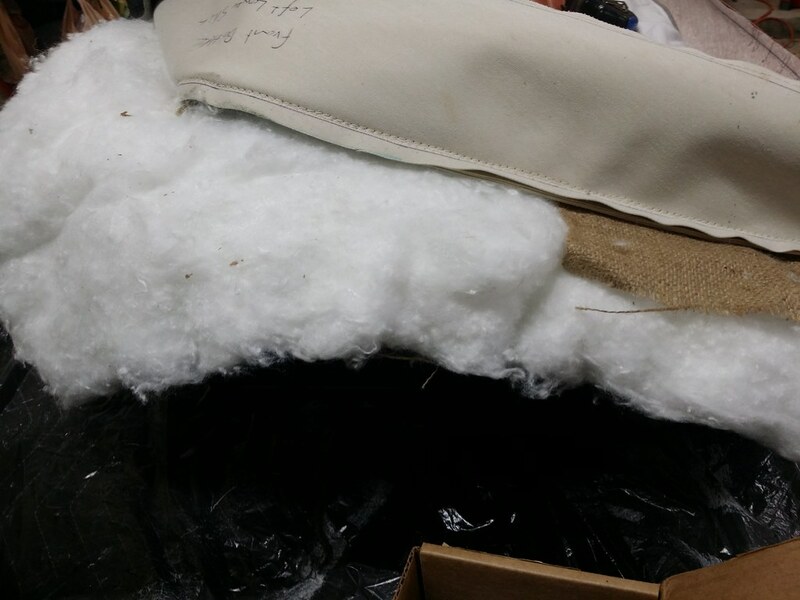 I've learned to take lots of photos and notes when disassembling a project. 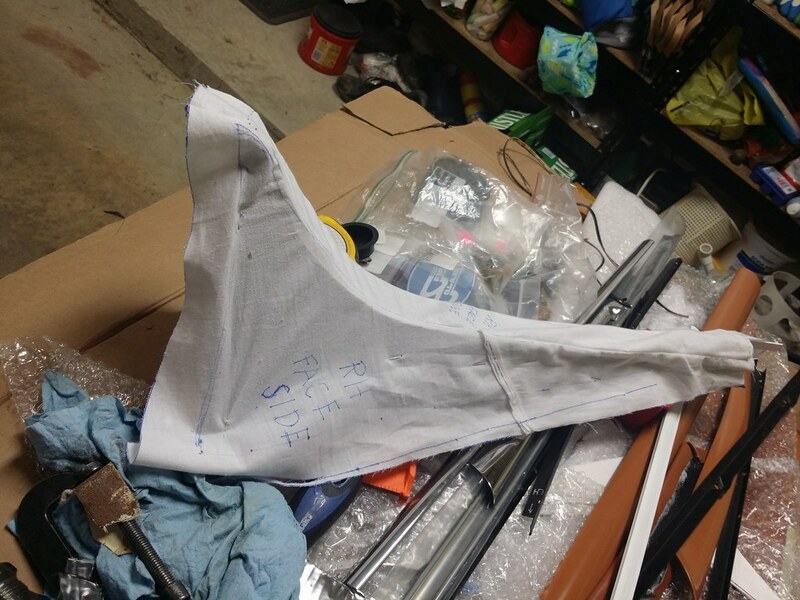 I also try to retain as many original parts as possible, just in case they can be useful. 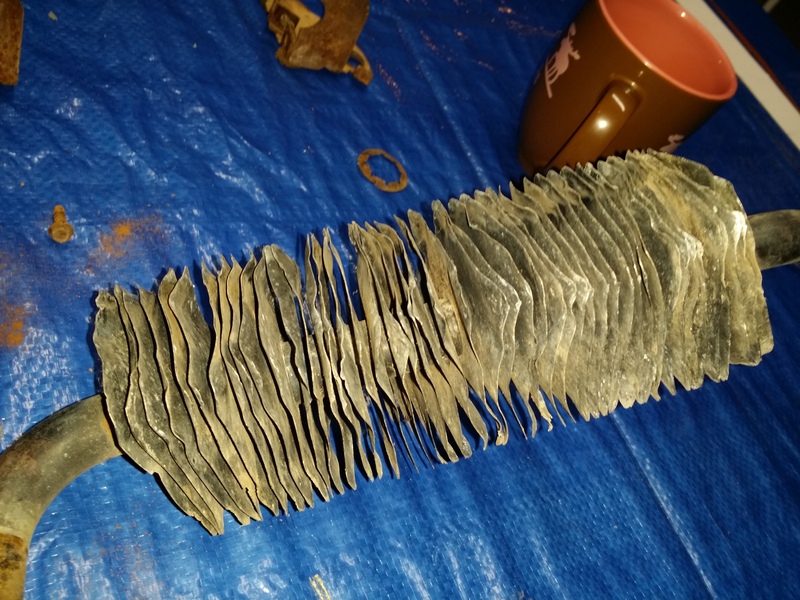 These remnants of the quarter window gaskets came in very handy. 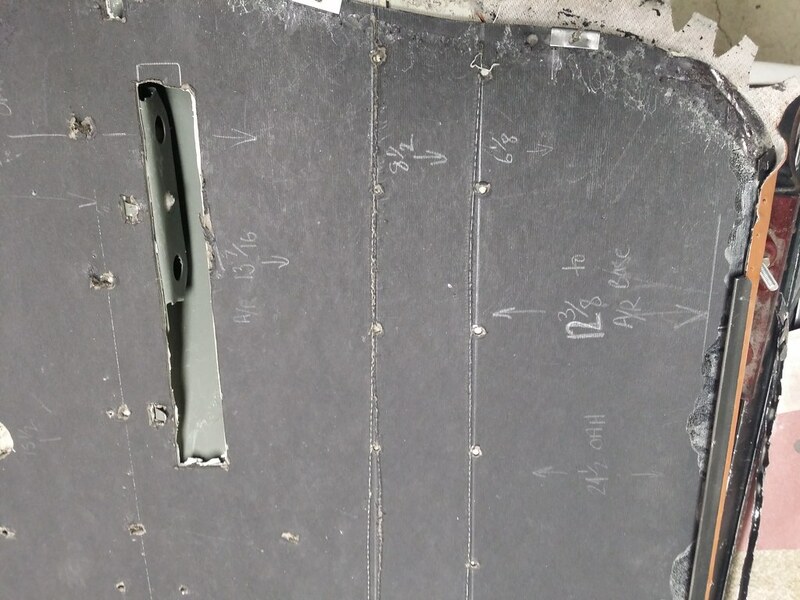 The witness marks on the outer surface indicated the correct orientation of the exterior molding clips and the dimensions of the gasket helped indicate how much material had to be removed and where it had to be removed. 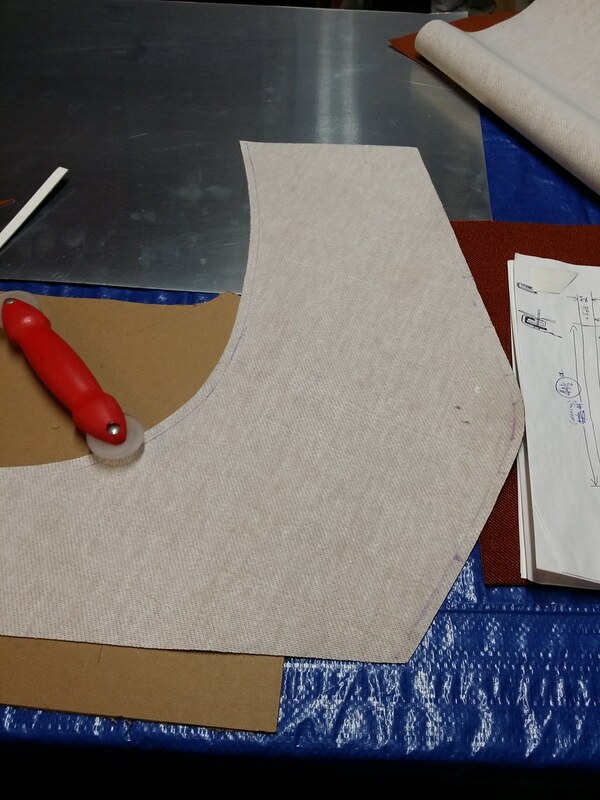 I used a fresh razor knife blade and a disc sander to shape the gasket. 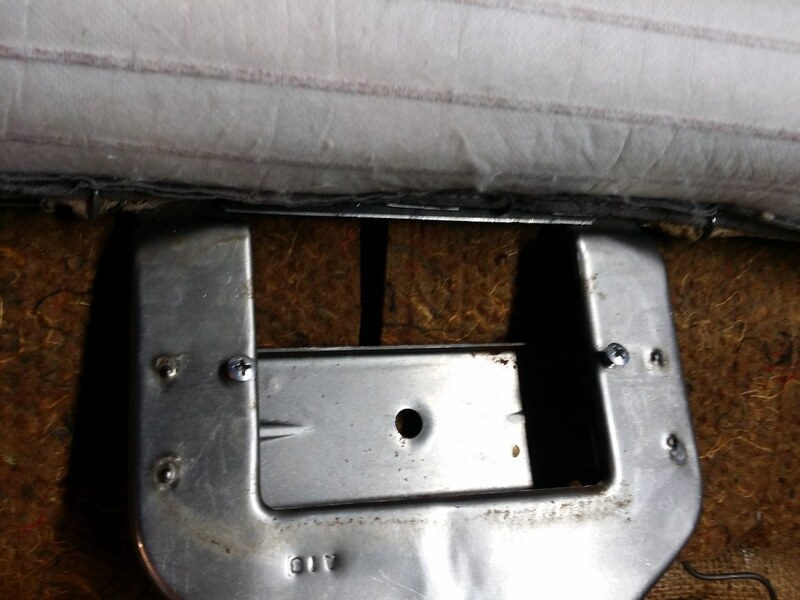 It took many iterations, removing only a few shavings each time, to get the gasket to fit into the opening. 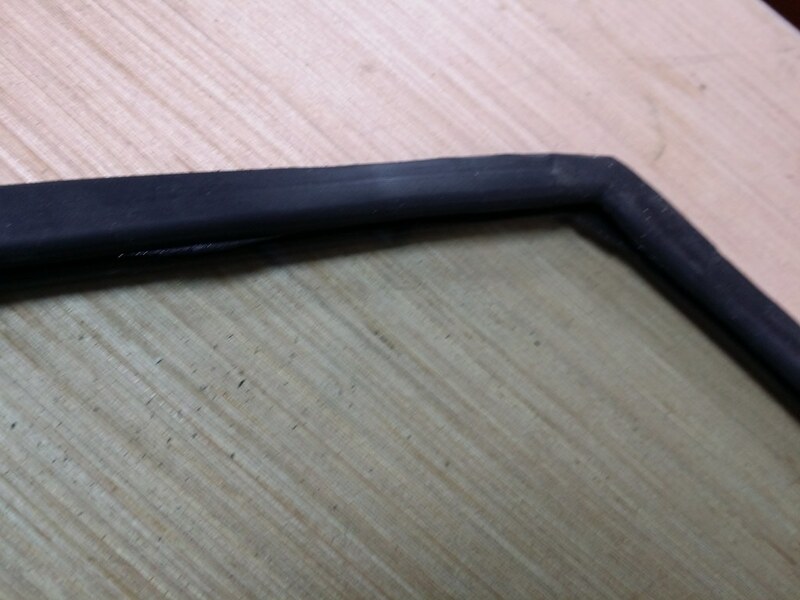 When the glass and gasket could be fit tightly into the opening, I removed the gasket from the glass. 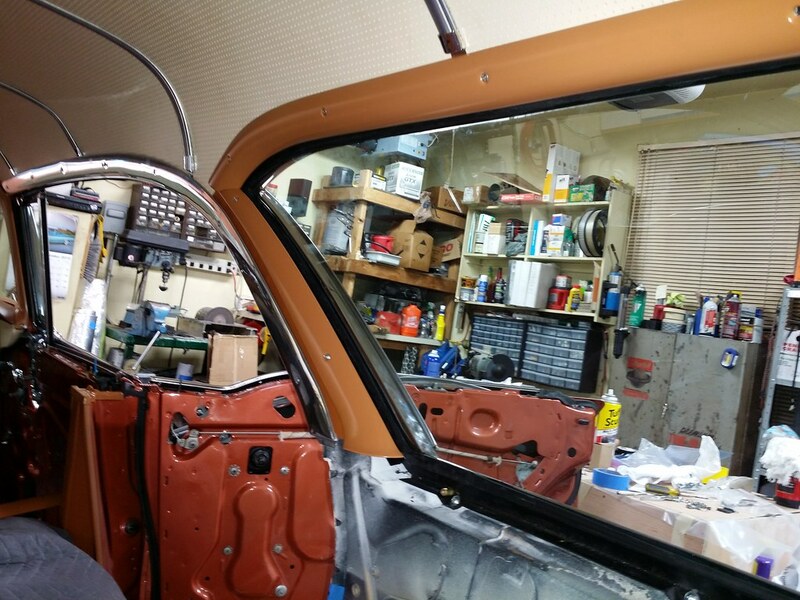 With a bead of bedding compound applied to the inside of the quarter window and some liquid detergent as a lubricant on the gasket, it was finally time to install the glass. 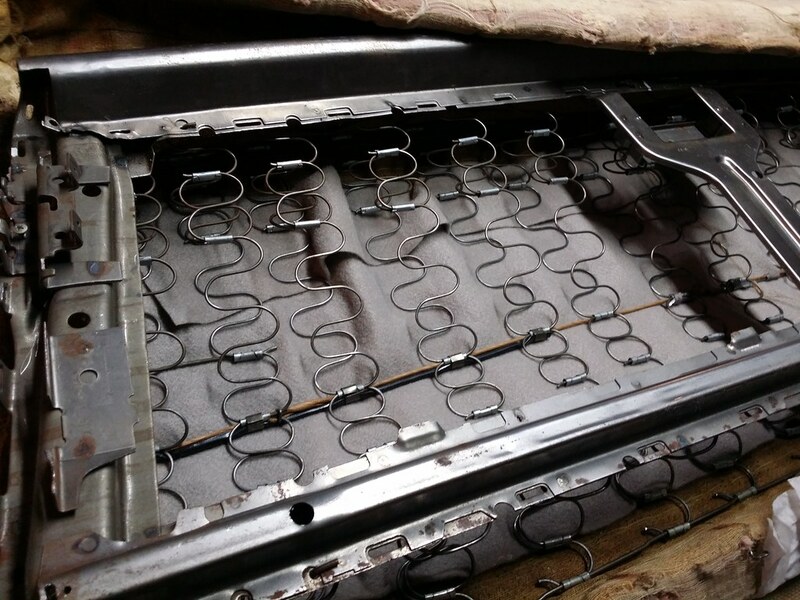 The glass is retained by 4 stamped retainers on the inside on the body. 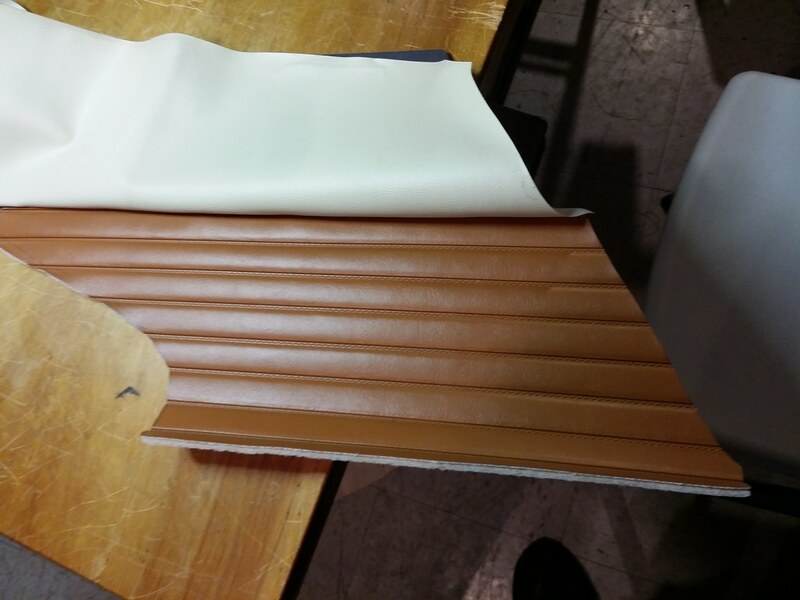 The exterior reveal moldings are retained by a variety of clips and threaded rods. 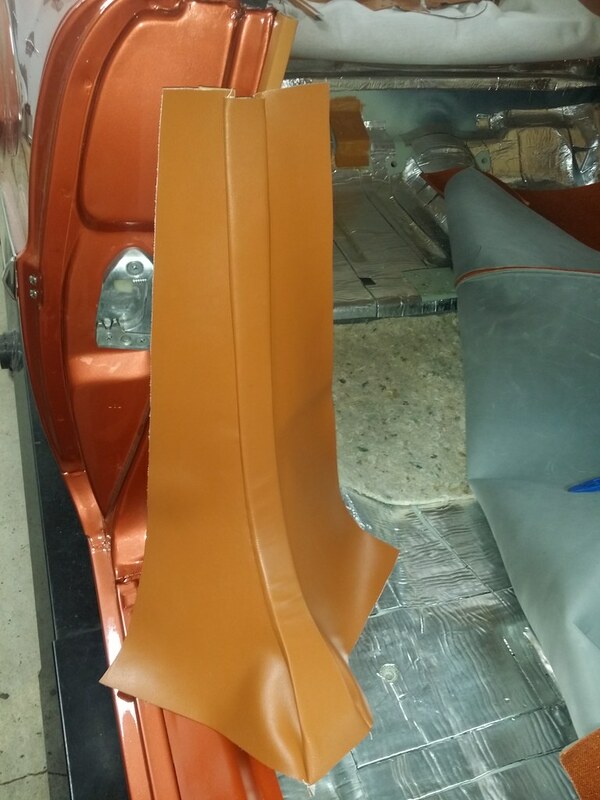 With the exterior moldings installed, the interior garnish moldings are next. 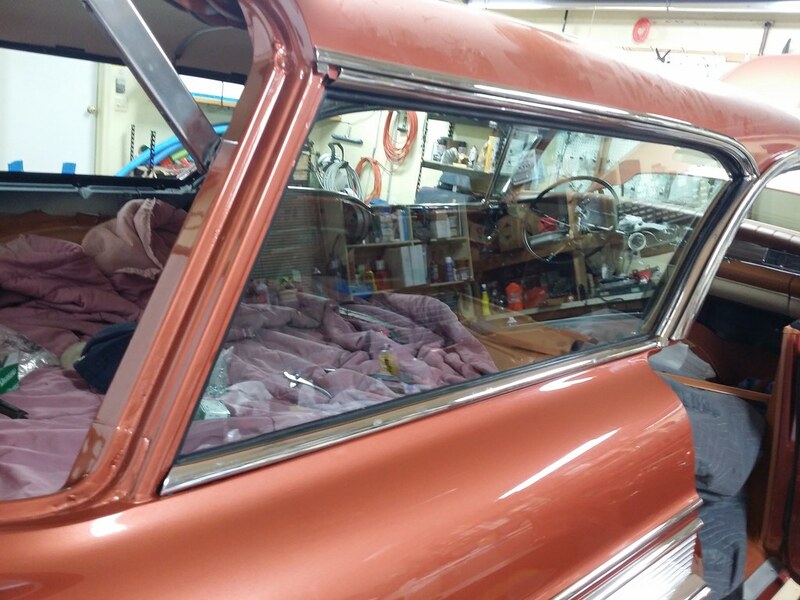 At the front of the quarter window, the C pillar trim consists of one painted steel garnish molding, a vinyl-wrapped trim panel, the polished aluminum roof rail molding plus a cloth windlace. 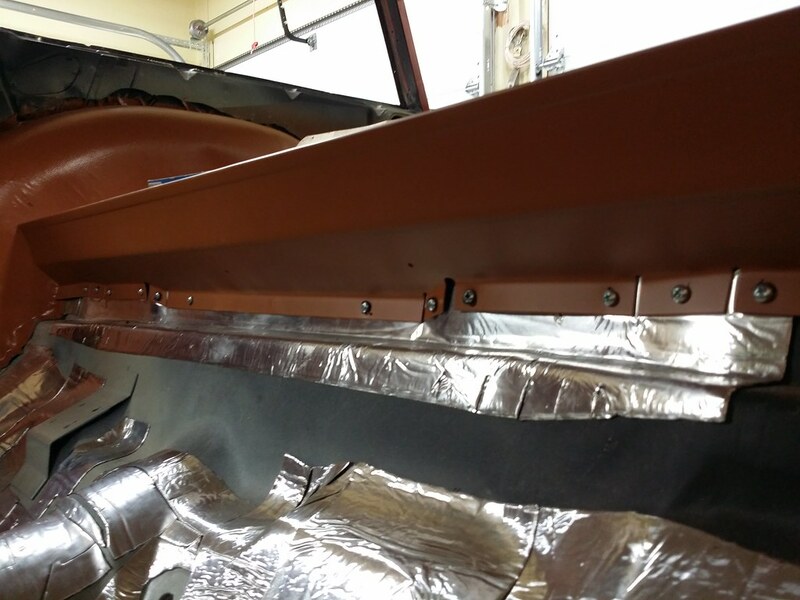 The vinyl-wrapped panel is installed first and is visible as a sliver of dark tan between the upper steel trim molding and the polished aluminum roof rail trim. 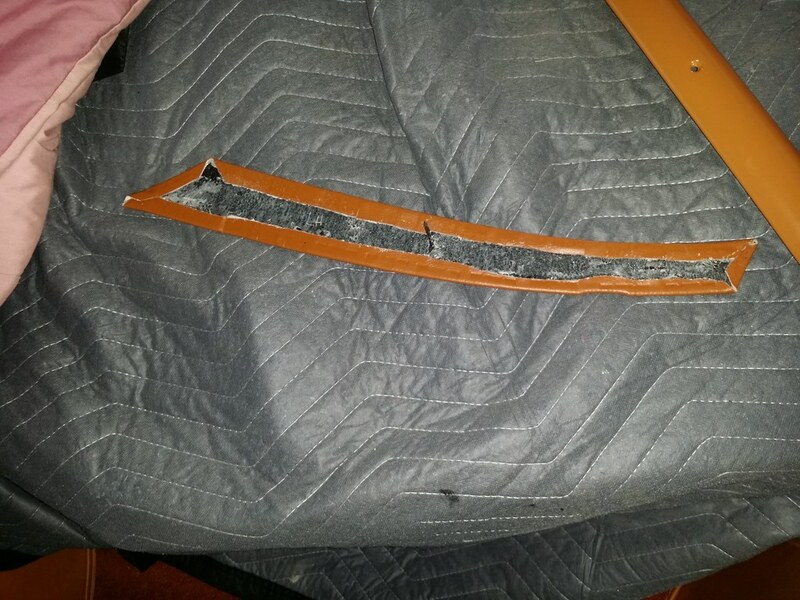 Originally, I had wrapped the steel panel with a single layer of cotton felt and the vinyl cover, which was exactly as the original piece was constructed. 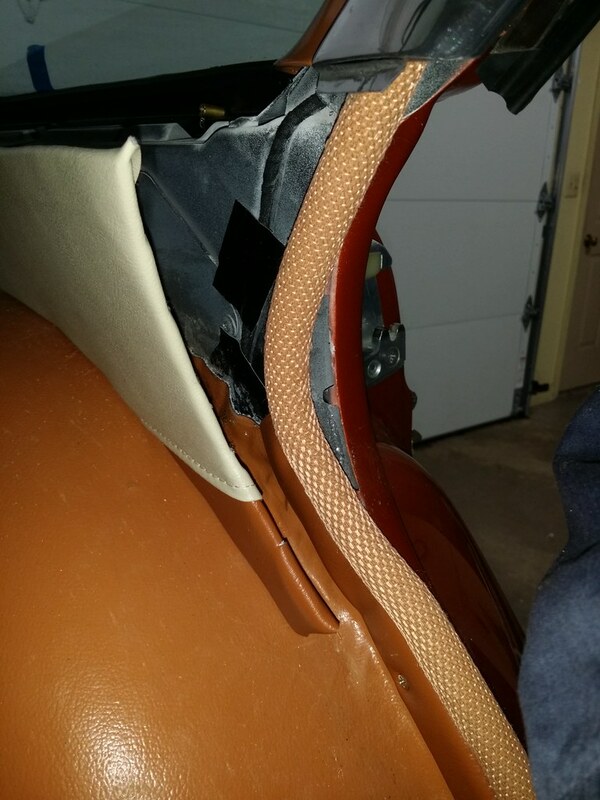 The part was too thick and it couldn't be loaded properly under the edge of he headliner panel. 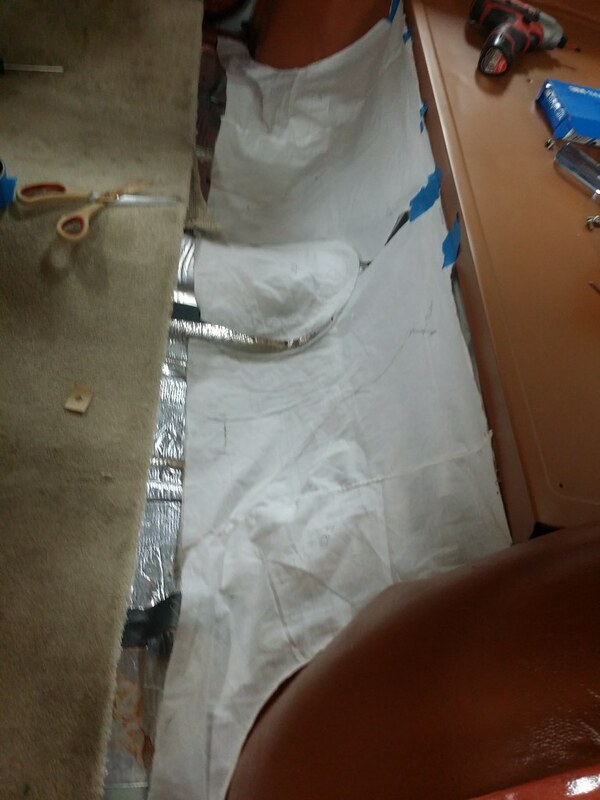 I had to remove the layer of padding and re-apply the vinyl directly to the steel substrate. 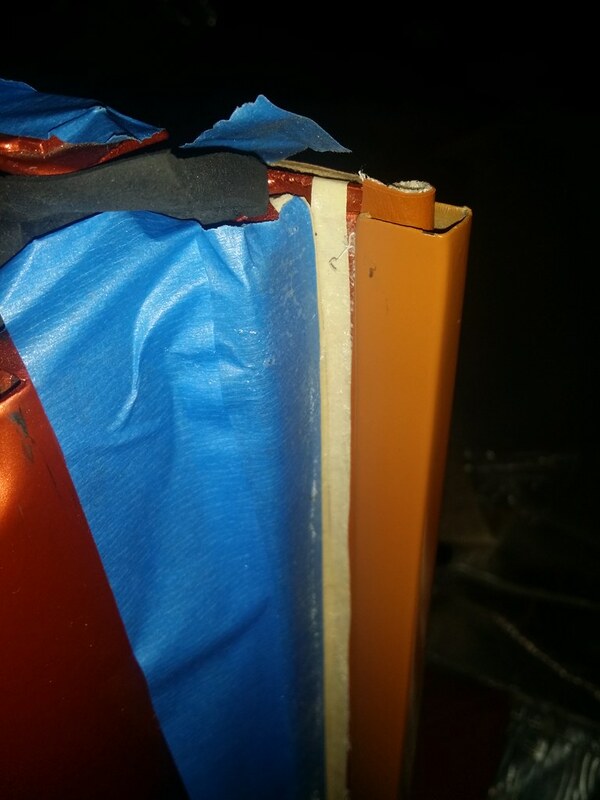 I had not realized that the new vinyl was significantly thicker than the original material; with the padding removed, everything could be properly installed. This is a stunning vehicle. 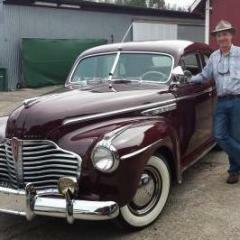 It will be at Autorama in Detroit this spring and at the Buick meet in OKC in June if all goes as planned. 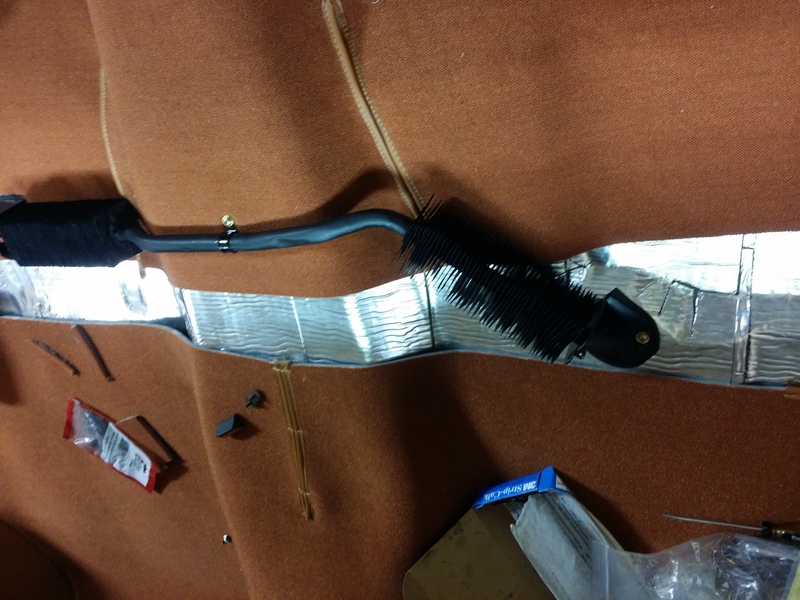 Things have been moving quickly as I prepare the car for its maiden show. 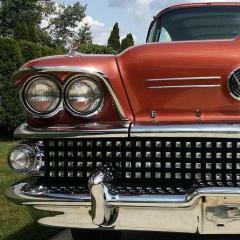 It will be displayed at the Detroit Autorama on March 1-3. 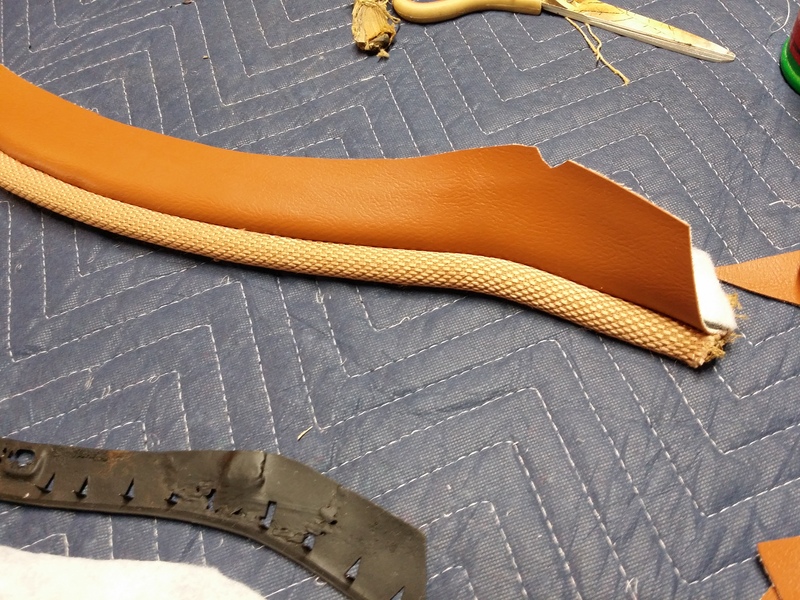 Early in December, I visited my friend Pat who has been working on the seat trim. 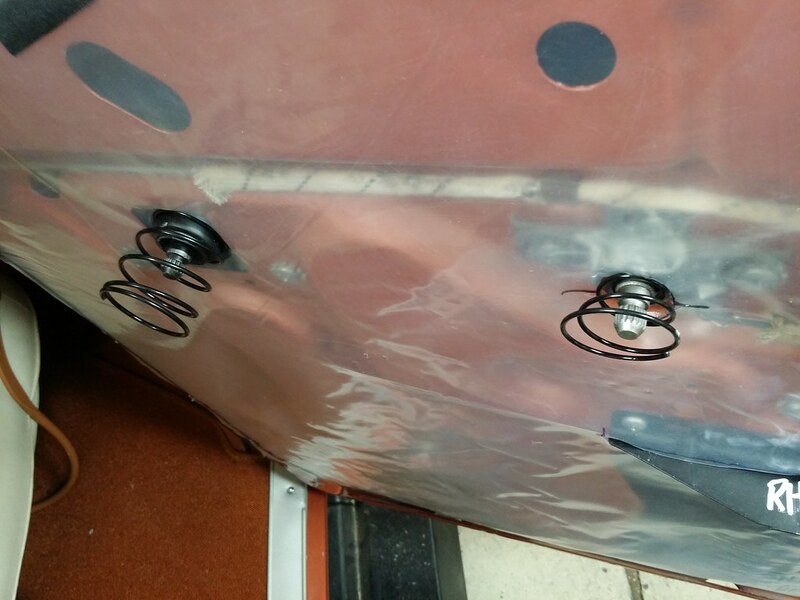 He had completed most of the covers and we planned to install the covers onto the frame & spring units. He had researched the correct appearance for the covers. 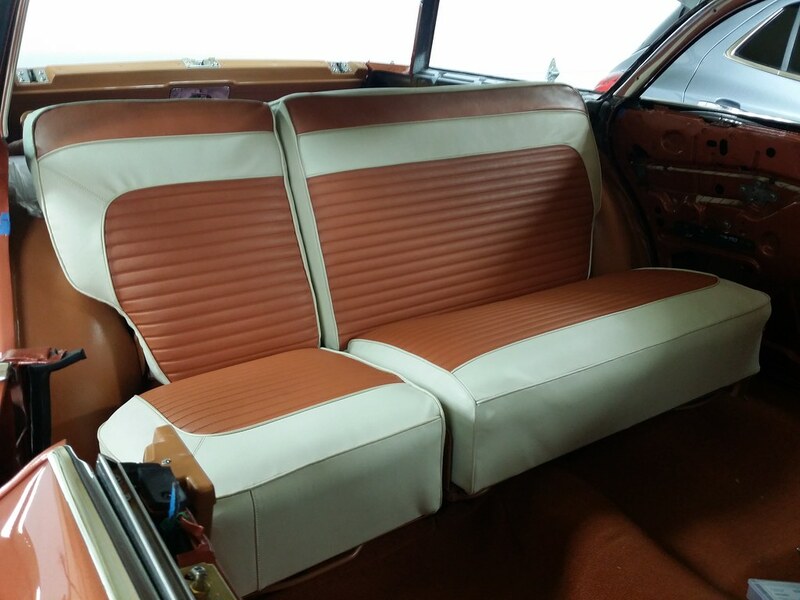 Images of interiors of several other cars showed that there was a lot of variation in the way the trim covers were sewn. 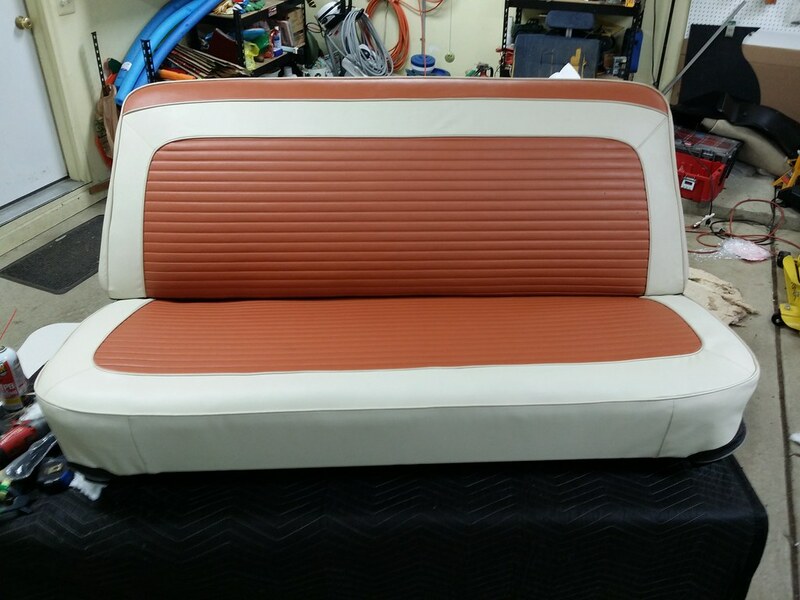 Here is the 1/3 section of the rear seat back. 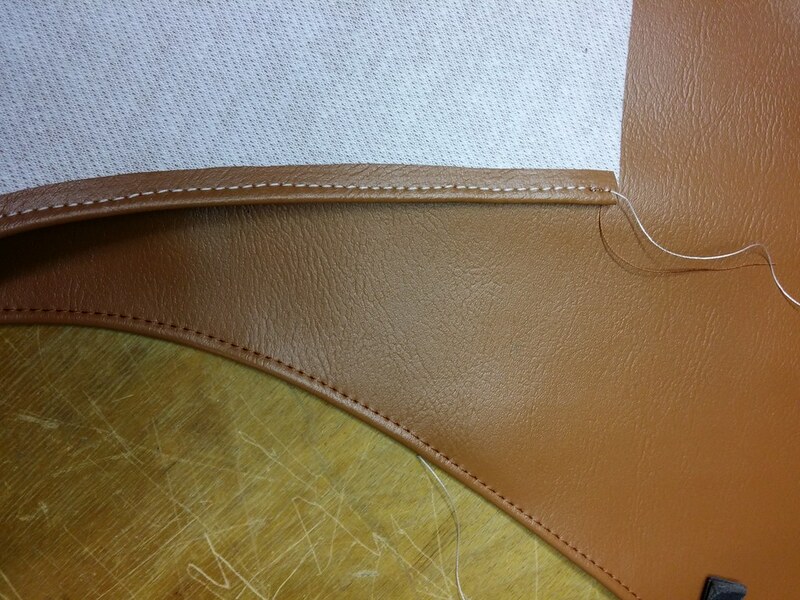 The short , angled french seam aligns perfectly with the insert stitch line and the corner of the tan and beige joint. 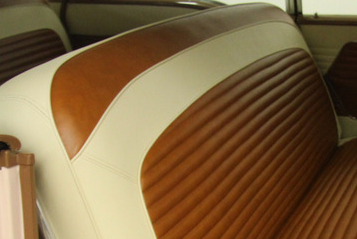 The upper edge of tan/beige joint is contoured to match the images in the 1958 Buick color and trim book and images of original interiors. 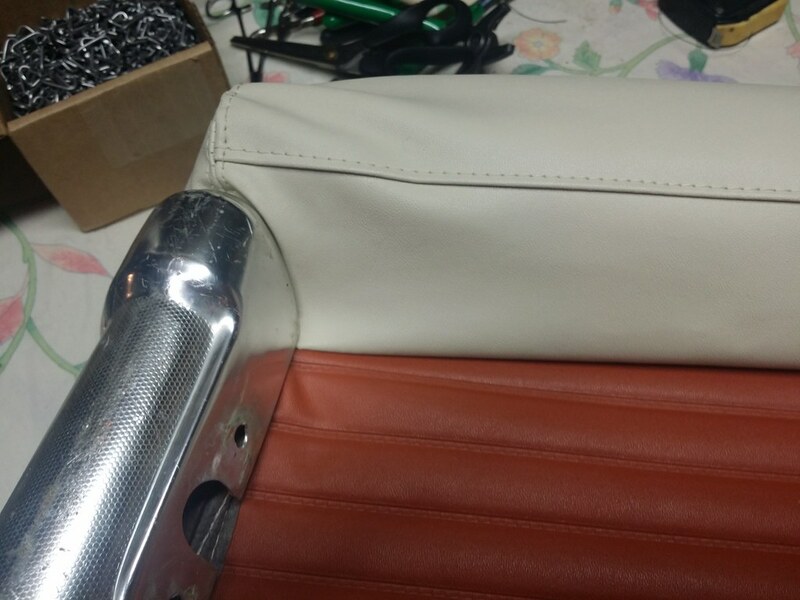 Here, I am beginning to assemble the 1/3 section of the rear seat back. 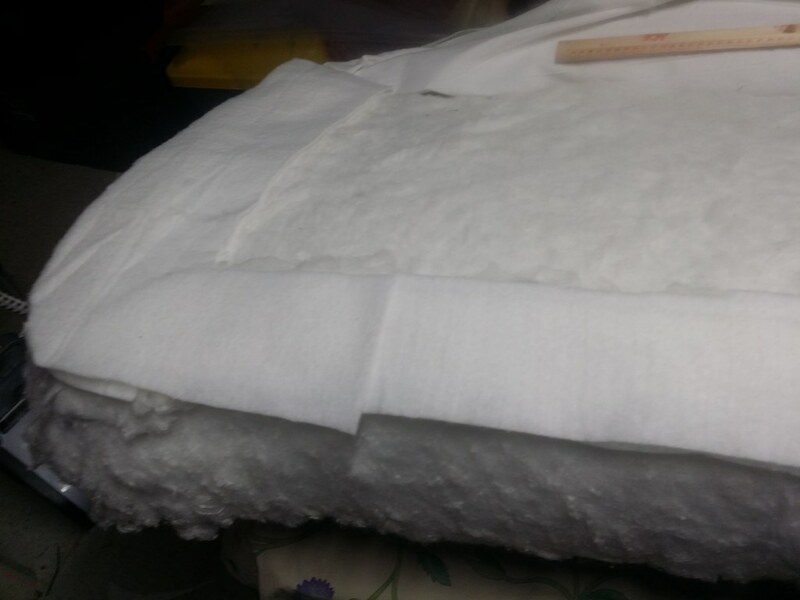 A perimeter wrap of non-woven polyester will help retain the shape of the side facings. Together in the car for the first time. I'm not happy with it, so I will disassemble it and start over. 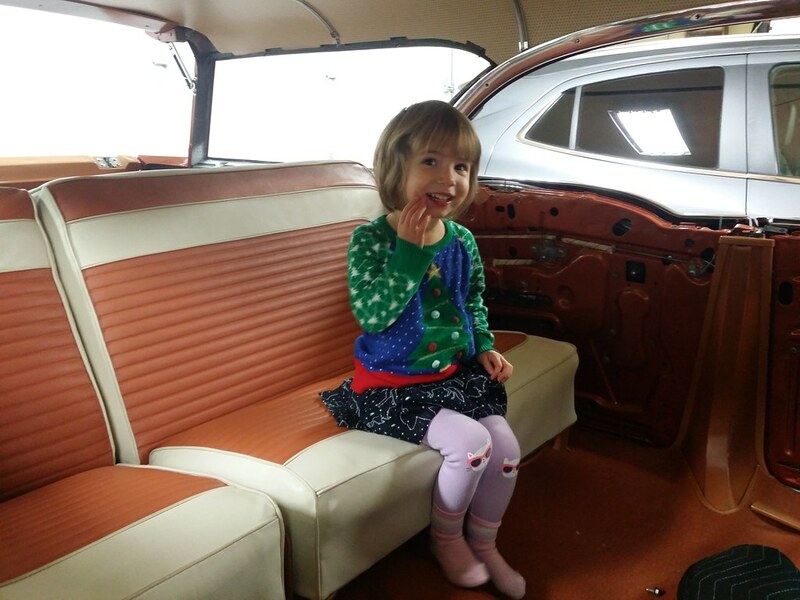 But my granddaughter gave it her approval for comfort! Joe, you are amazing and in inspiration to us all! Well, I understand and it is your car after all -- but I'll wager what you have now is still nicer than the way most left the factory in Flint... The finish line is in sight! Someone needs to show GM how it is done by example. GM should stop pandering to its labor force, but to its buyers. 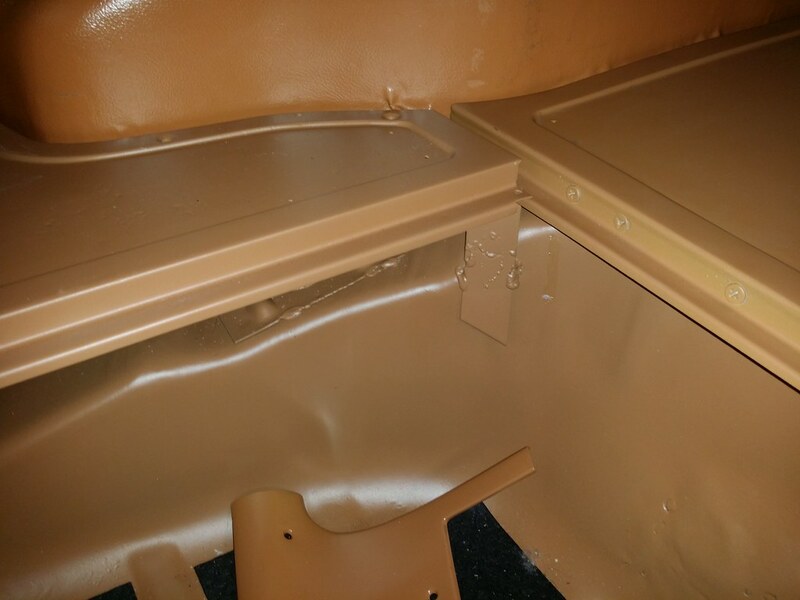 First step in assembling the front seat back was to clean, paint and inspect the seat frame and spring unit. 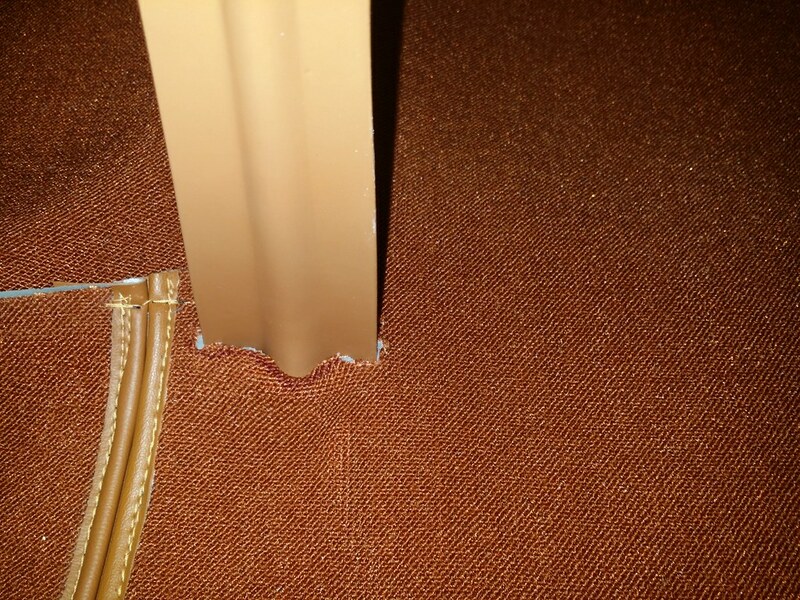 The transverse spring wire that supports the individual zig-zag springs (essentially the lumbar support) was fractured and had to be replaced. 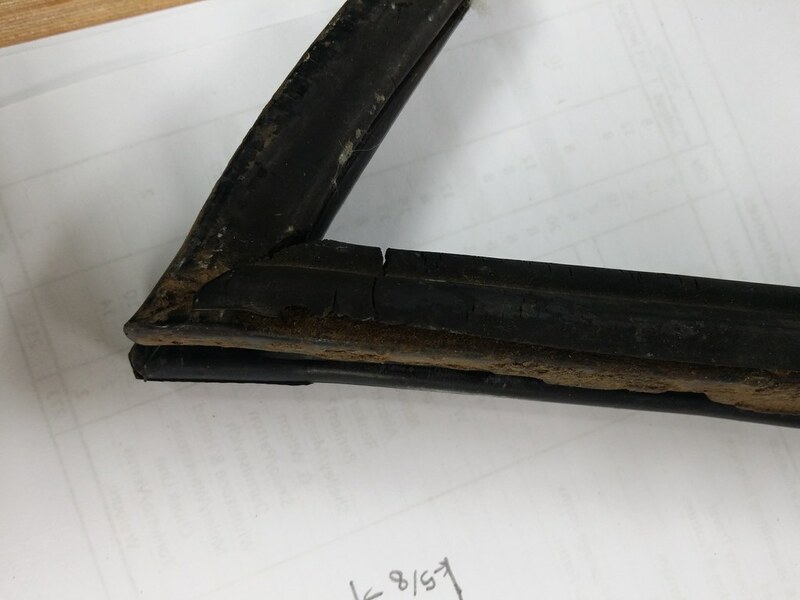 This frame came from low-mileage car and was in excellent condition. 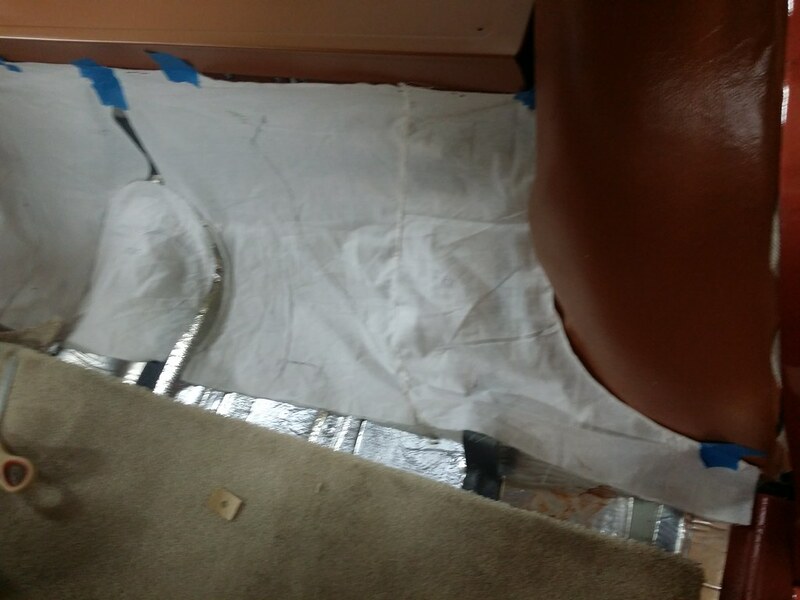 The clean, shiny metal you see is as the frame appeared when the old trim cover was removed! 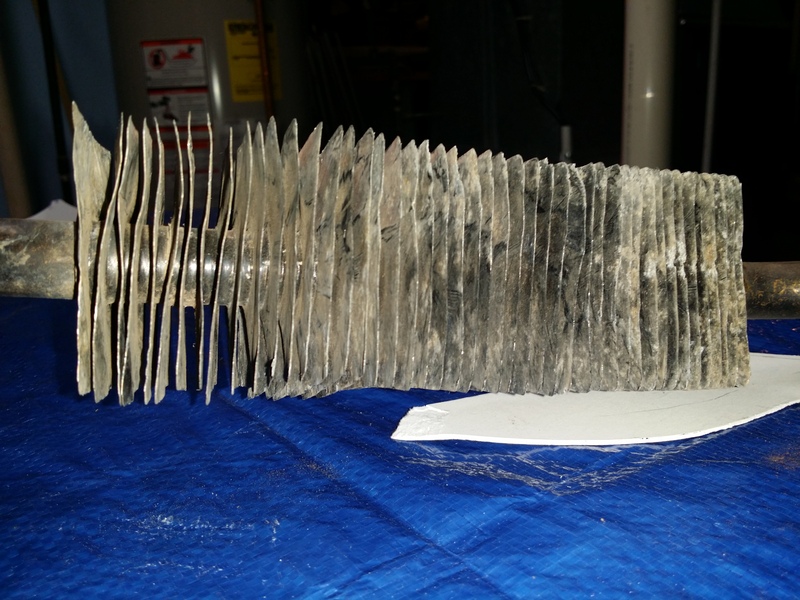 It has been coated with a clear protectant to preserve it. 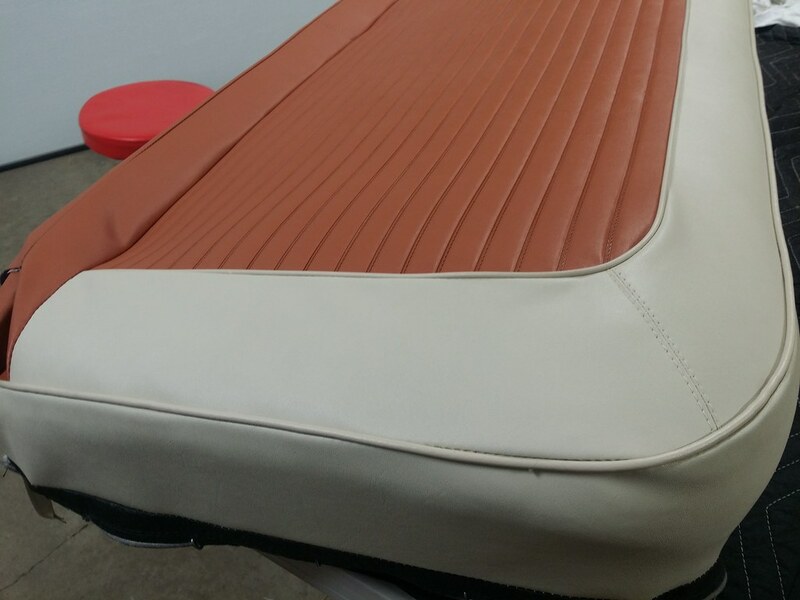 Initial test fit of the trim cover and side panel to ensure that all the seams will be covered by the side panels as designed and sewn. 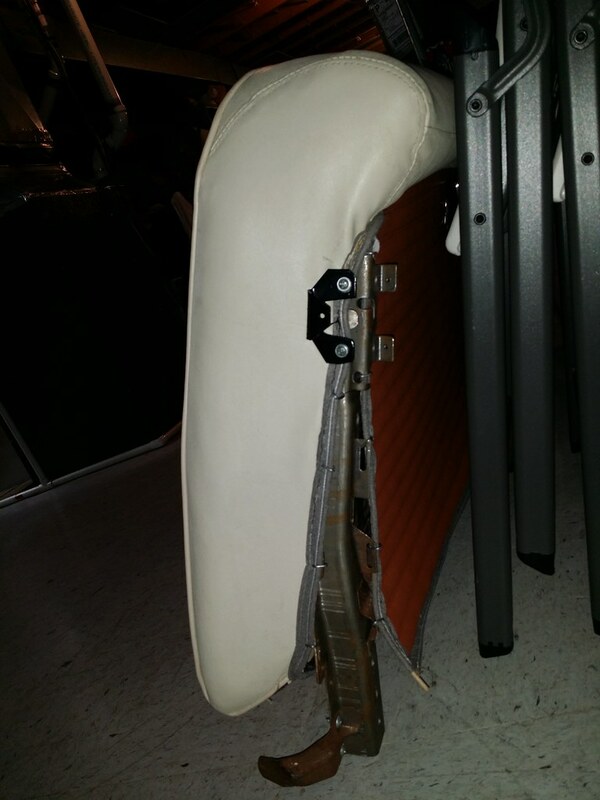 I installed the 2 screws that will ultimately attach the ash tray to the seat back. 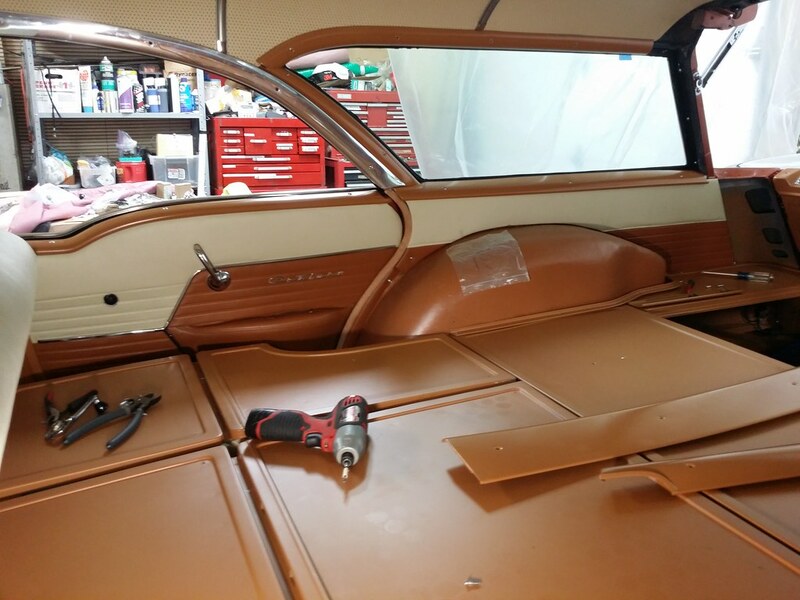 Having the screw heads in place will make it much easier to locate the attaching points for the ash tray after the trim cover has been attached to the frame. 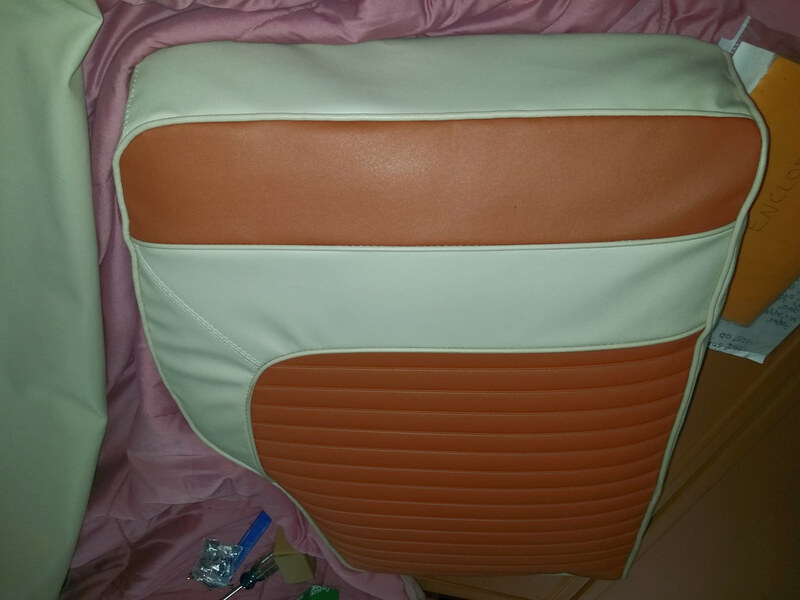 Visible at the top of the above image is the first point of attachment of the seat cover. 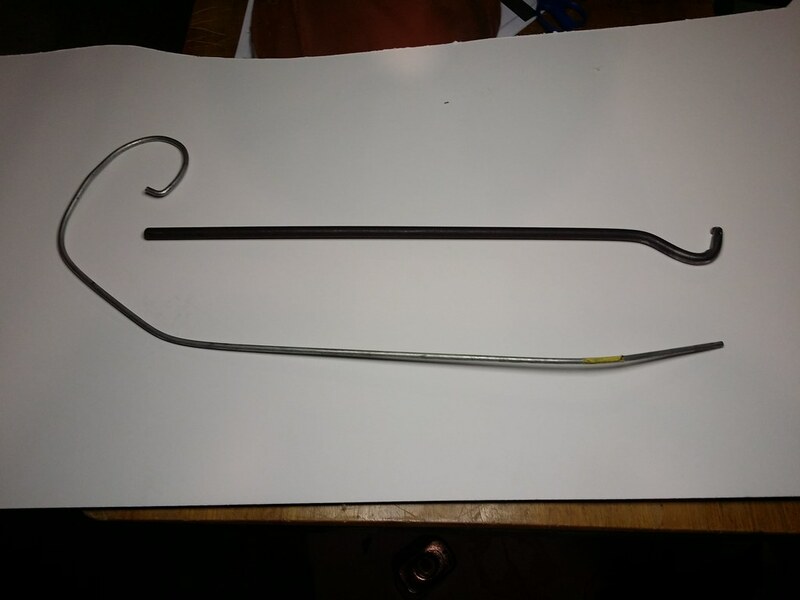 There is a wire-reinforced upper bolster that is attached via hog rings to the upper frame rail. 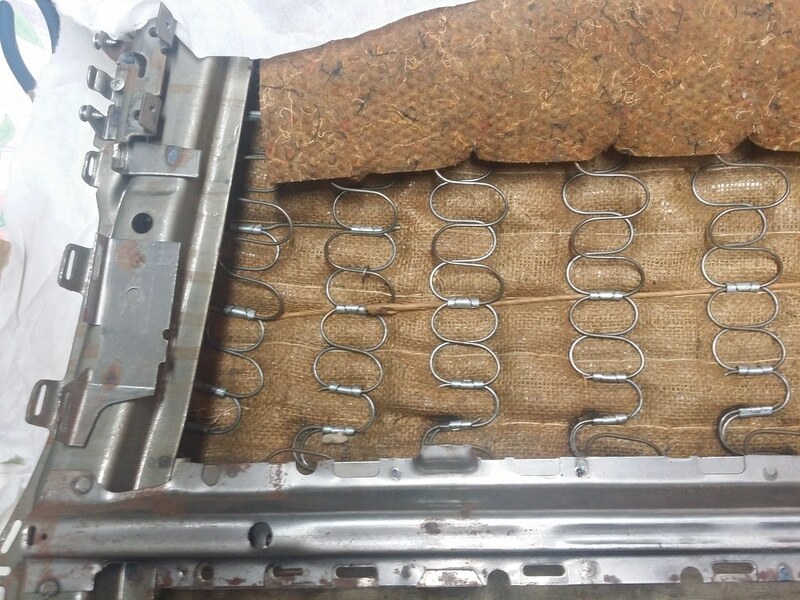 The heavy felt isolator is installed between the two layers of springs in the seat back spring unit. 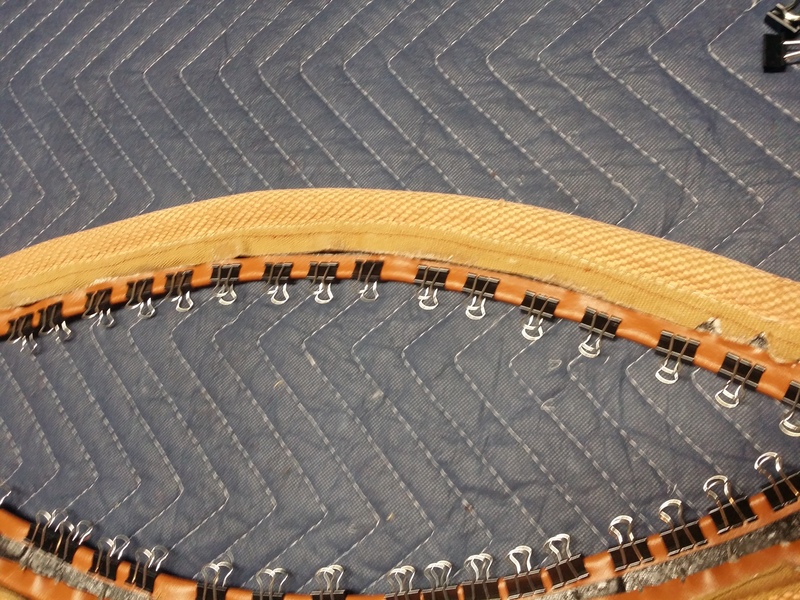 The trim cover is drawn over the perimeter of the frame and retained with hog rings. 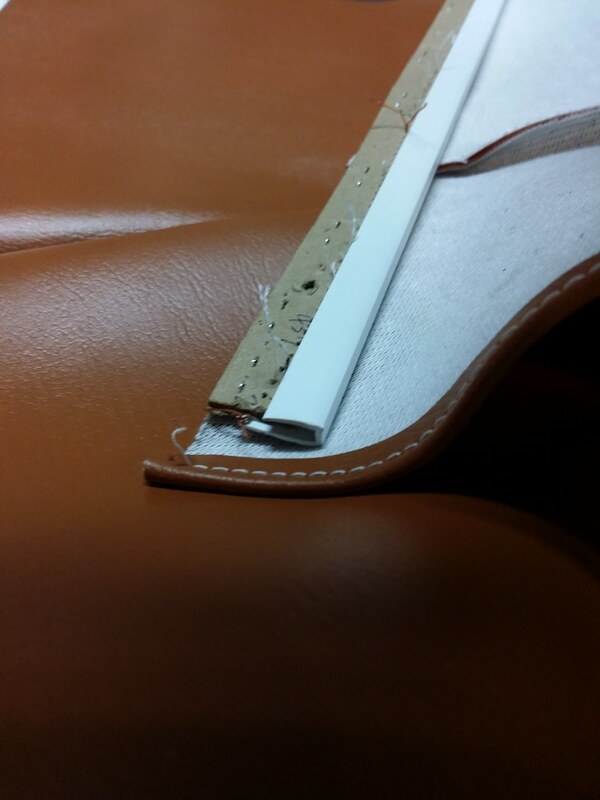 After installing the cover and verifying the fit of the side panel, the upper bolster looks loose and baggy. 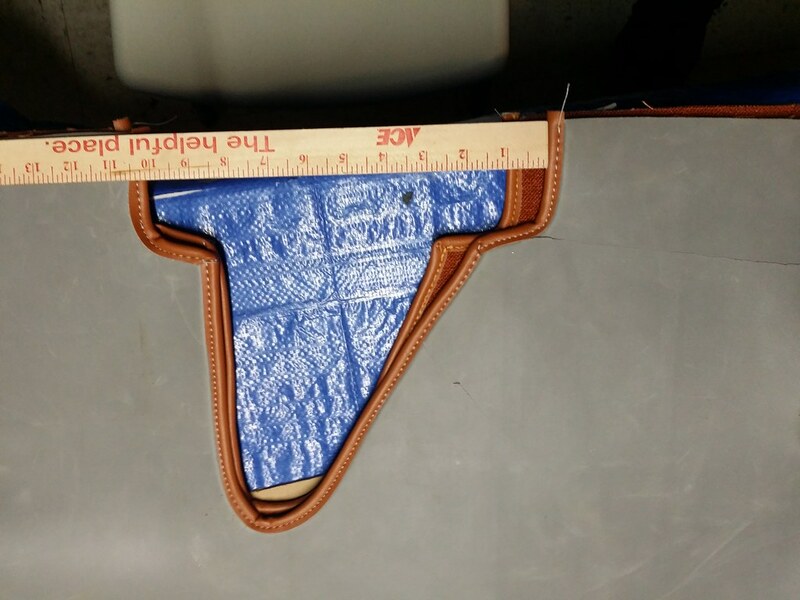 The area beneath the french seam required additional padding to fill out the cover contours. 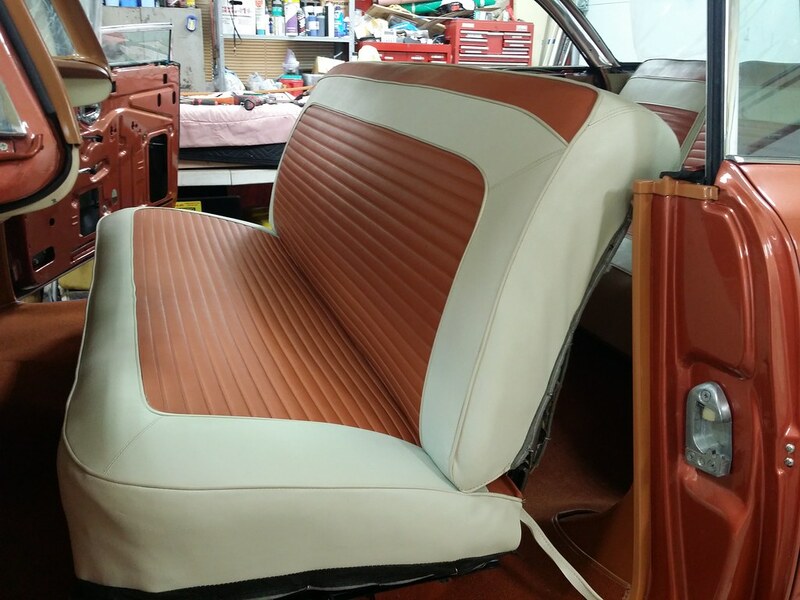 End view of the seat back after revising the corner padding. 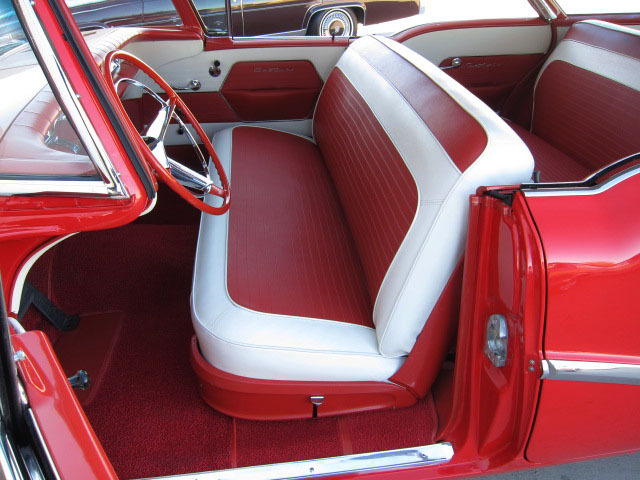 The 1958 Buick foam seat cushions were among the earliest applications of molded urethane foam seating components. 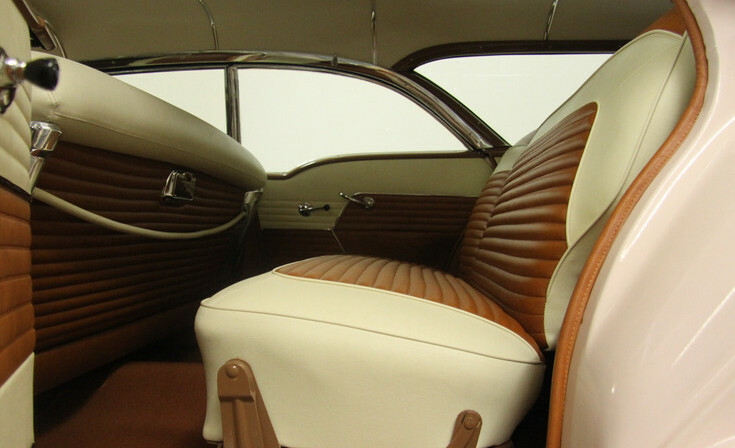 The Special models retained the traditional spring and pad designs for the seat cushions and backs. 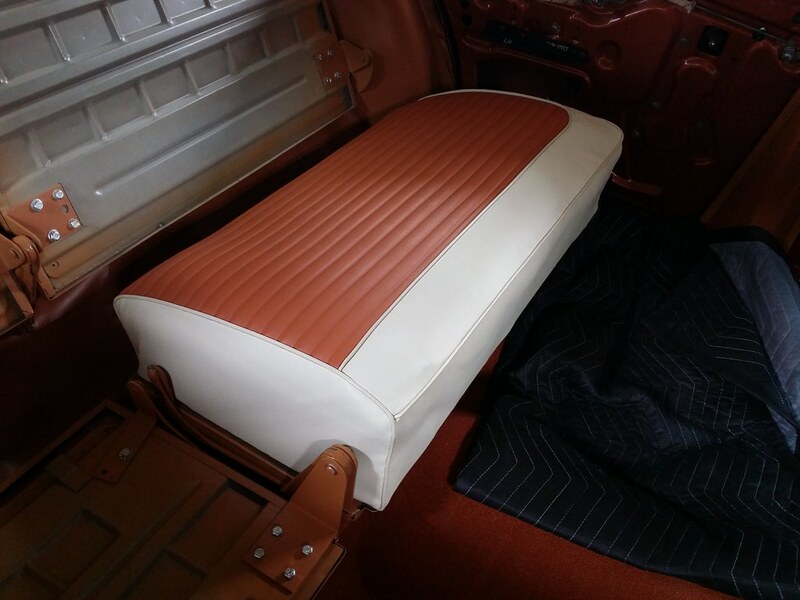 The Century, Super, Roadmaster and Limited models were equipped with foam seat cushions, but retained "spring and pad" seat back pads with rubberized horsehair pads. 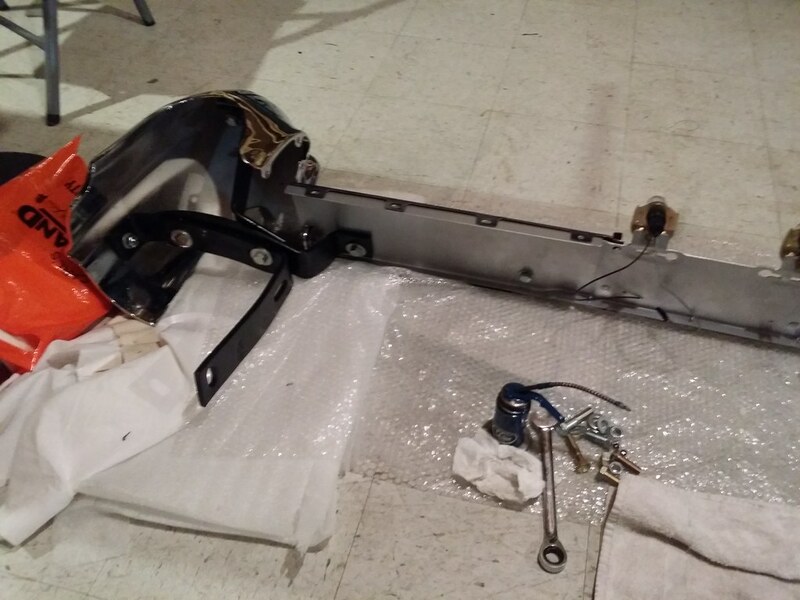 I disassembled the seat frame and cleaned and painted the steel structure. 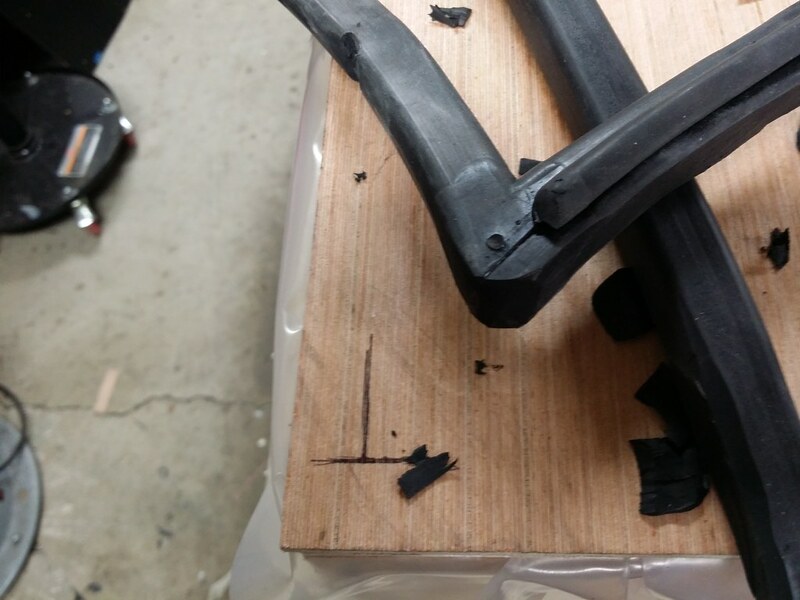 Since the cushion frame had some surface corrosion, I used a more aggressive treatment and then painted the frame black. 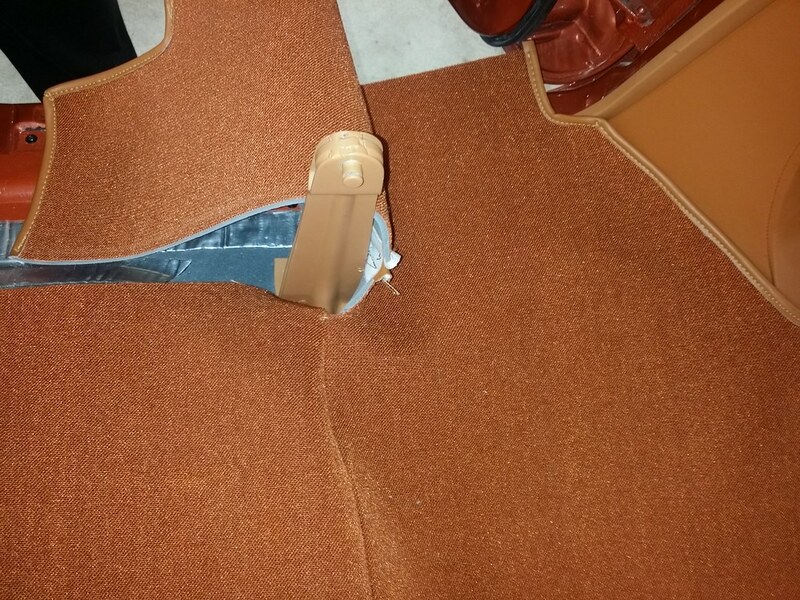 I inserted a stiff reinforcement layer of woven carpet material between the springs and the foam layer, hog-ringing the carpet to the zig-zag springs to ensure that the underlayment would not shift with occupant entry/egress. 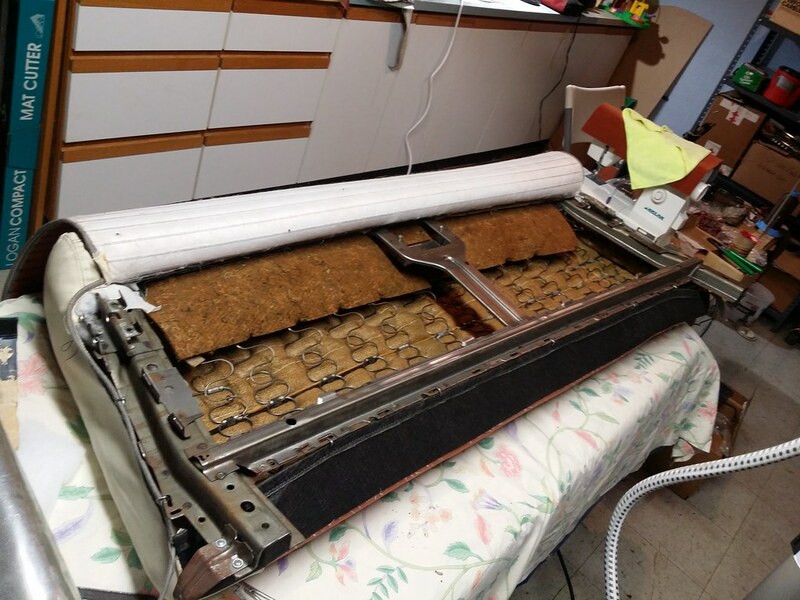 The carpet replaces the original layer of cotton burlap, which had long ago lost its ability to support the foam and isolate it from the springs. 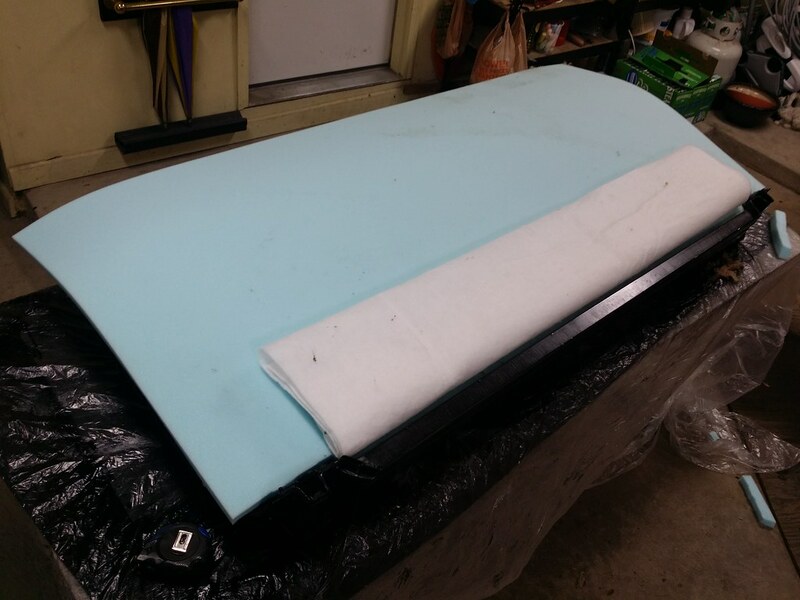 New foam is installed, along with a layer of non-woven cotton/poly felt to retain the rear edge of the foam to the frame. 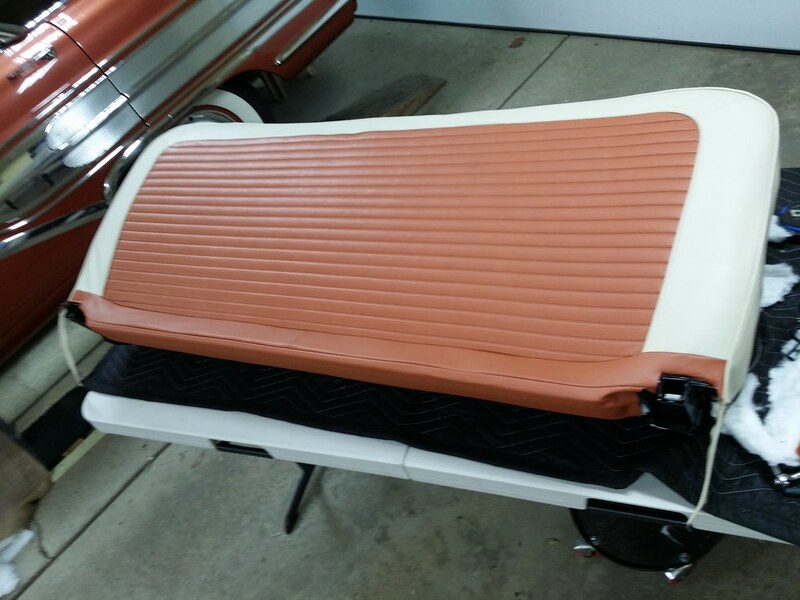 The felt also acts as an insulator/isolator between the rear section of the trim cover and the "bar cover", or rear bottom section of the frame. 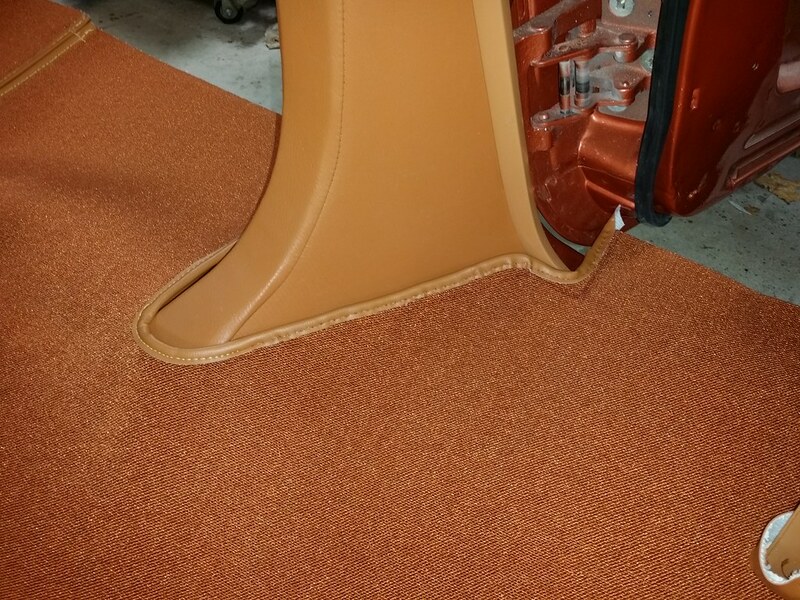 The foam is trimmed to shape and "skived" or contoured at the perimeter to give a smooth appearance of the cover after assembly. 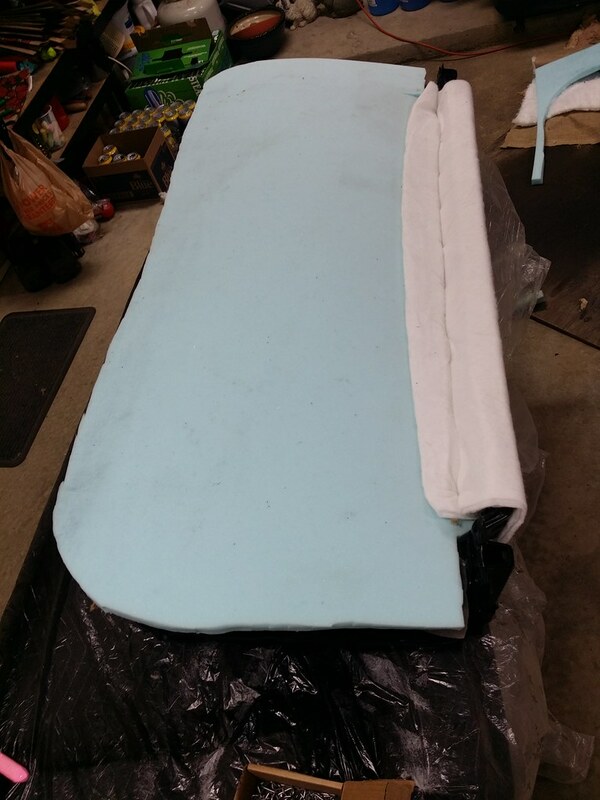 I have found that an electric carving knife works great for shaping and contouring the urethane foam. 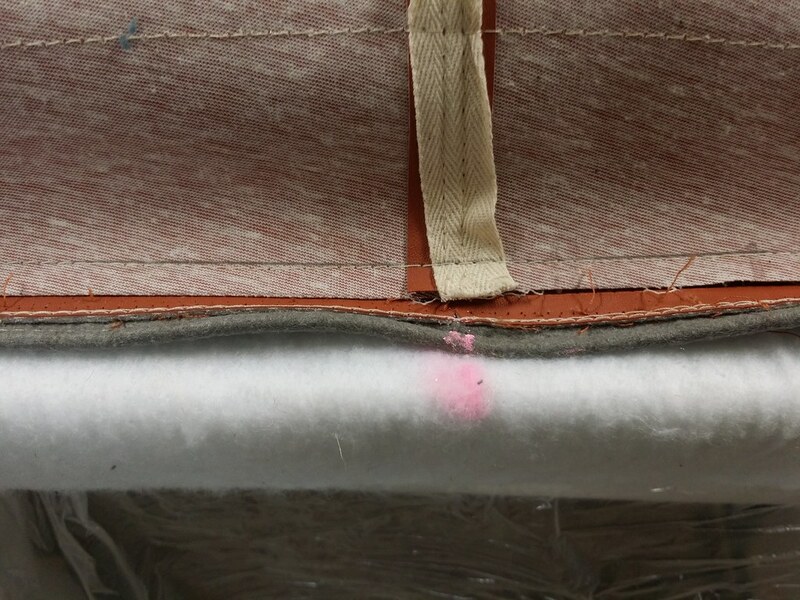 The pink chalk mark highlights the center of the frame and the center of the trim cover. 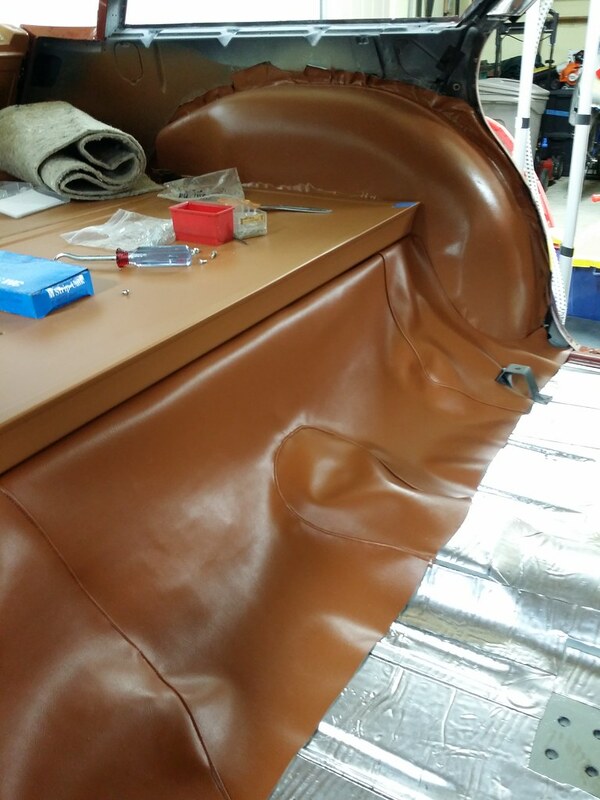 I always start in the center and work outwards from the center to establish and maintain the proper cover position on the seat. 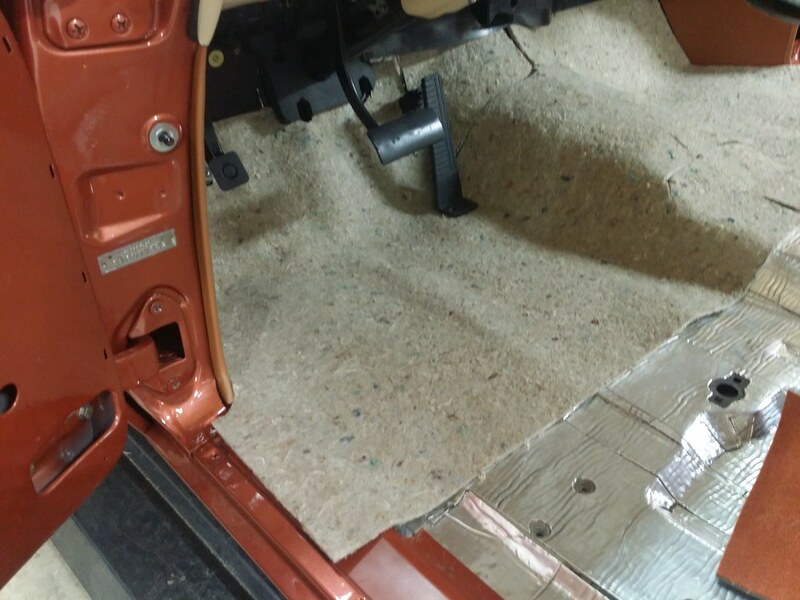 The first step in retaining the cover was to hog ring the rear "tie-down" to the lower portion of the seat frame, just beneath where the forward edge of the seat back would eventually be positioned. 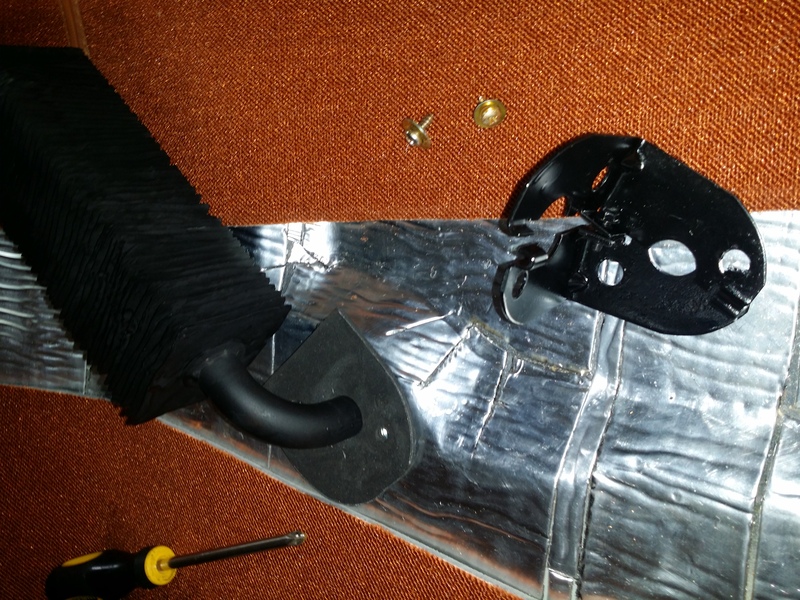 Then, working out from the center, hog-ringing the perimeter of the cover to the frame. 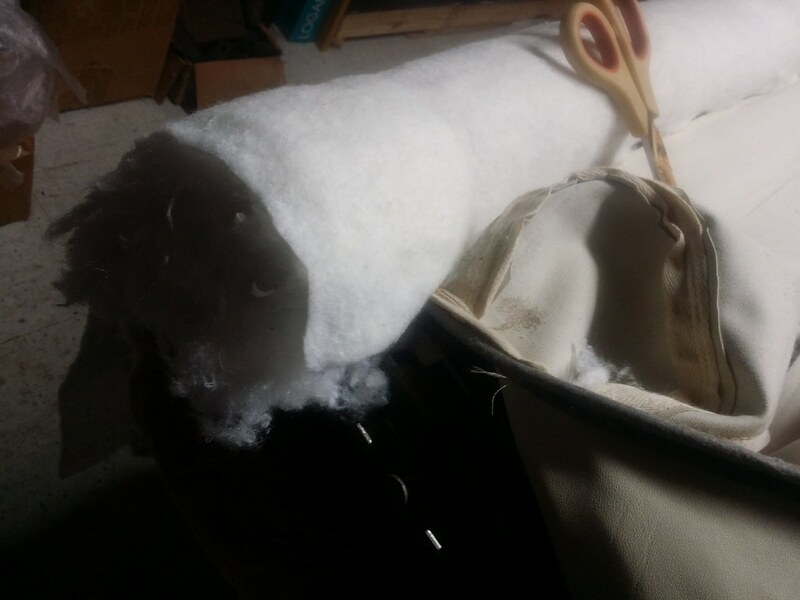 After building up the assembly, I determined that I needed additional padding to get the required comfort, fit and appearance. 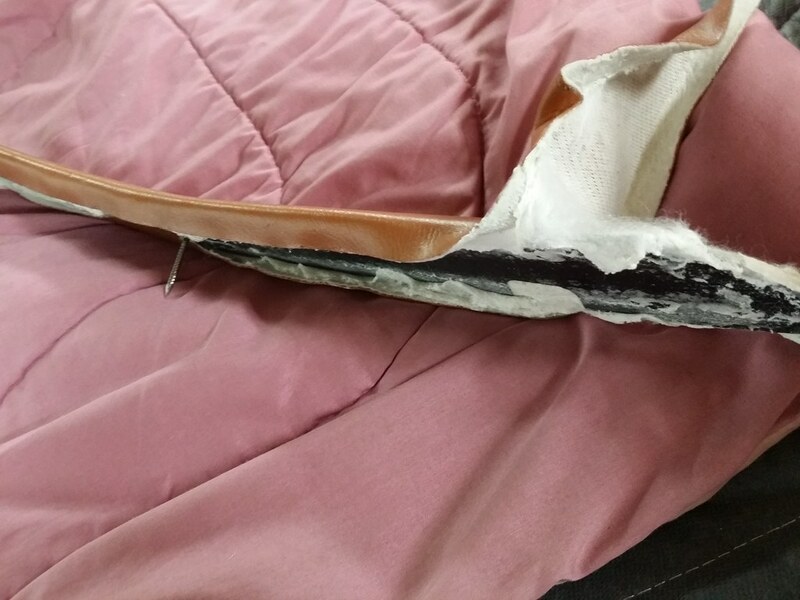 The cover was too loose on the pad assembly. 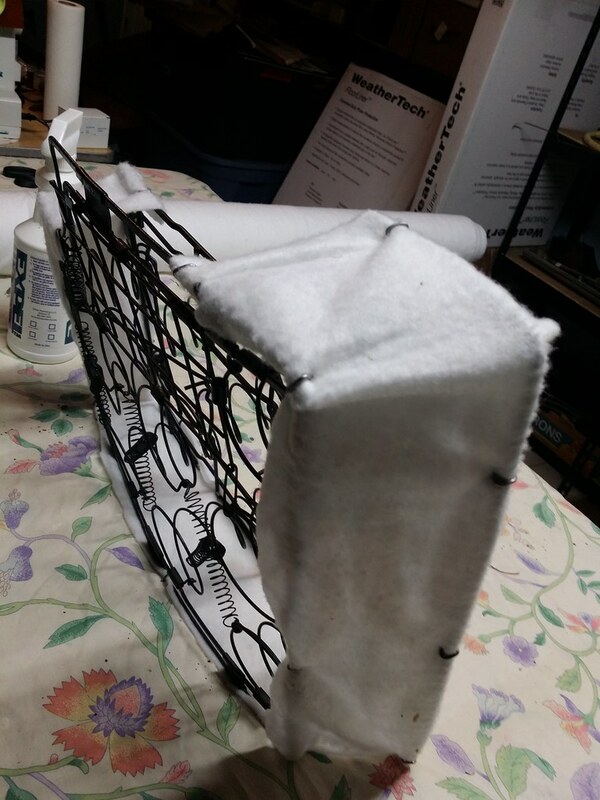 I removed the cover from the frame and added a thin layer of padding over the entire seating surface, with additional layers around the perimeter to provide a more full looking perimeter. 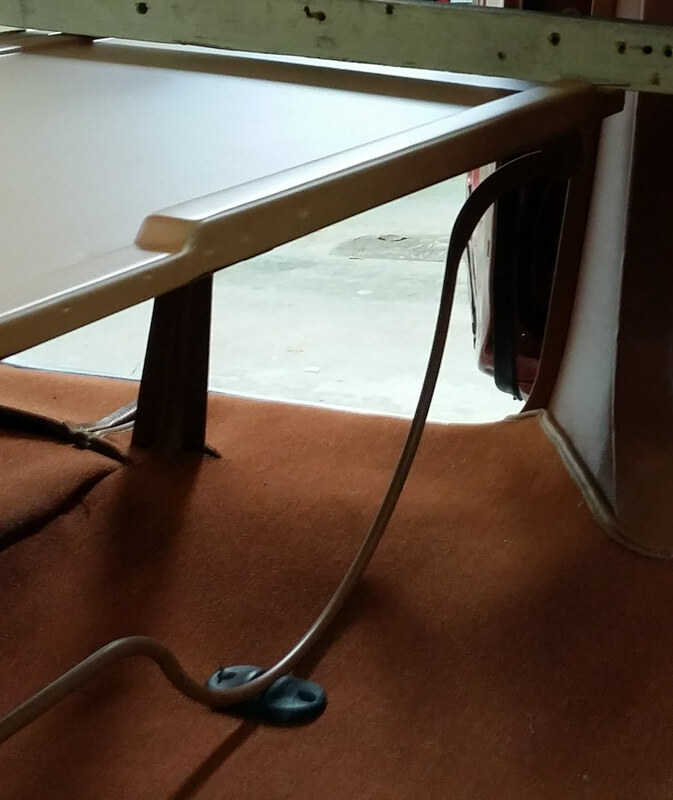 Attaching the seat back to the cushion is accomplished with 6 - yes, 6! 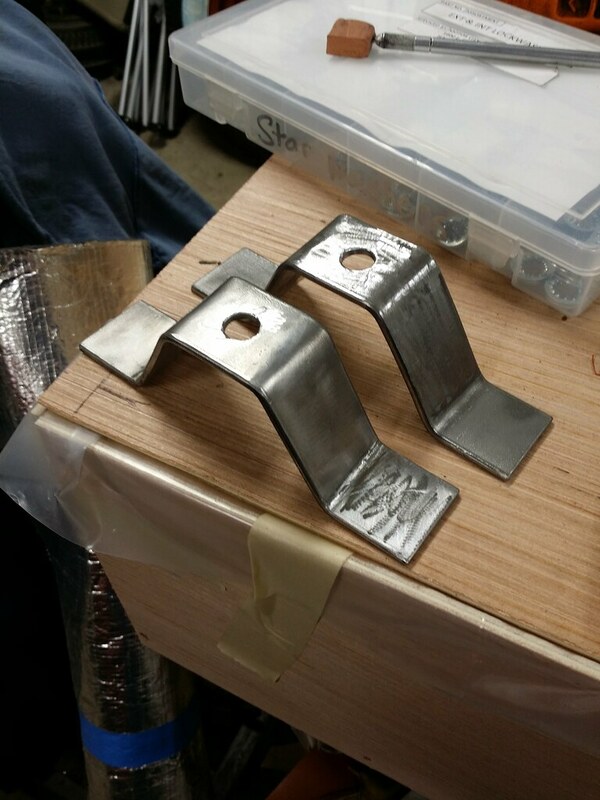 - 1/4-20 bolts. It will be challenging (impossible?) 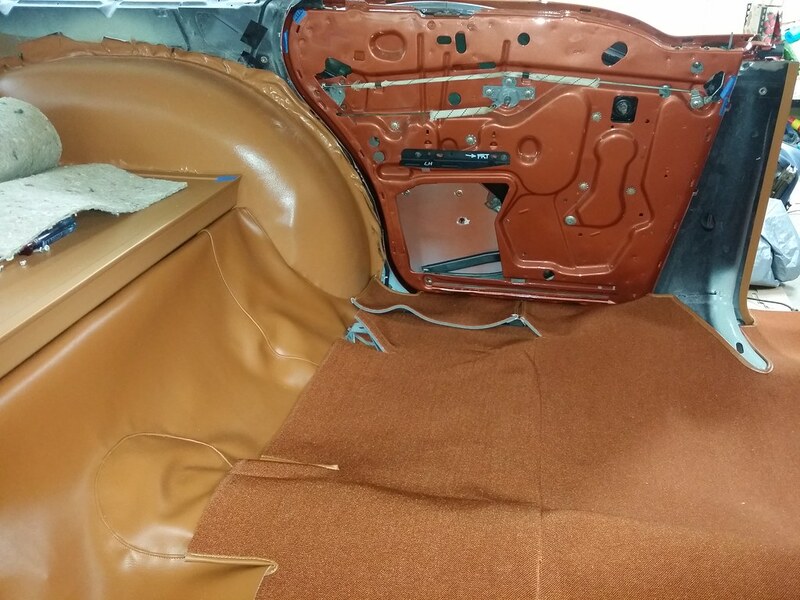 to install the seat side panels in the vehicle, but the side panels are still at the anodizer's facility. 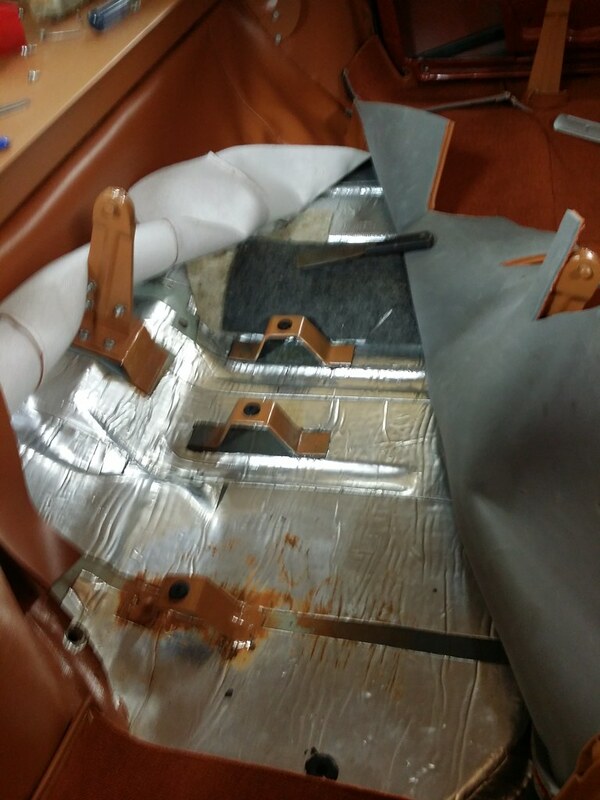 If necessary, the seat will be removed to allow installation of the aluminum trim panels. 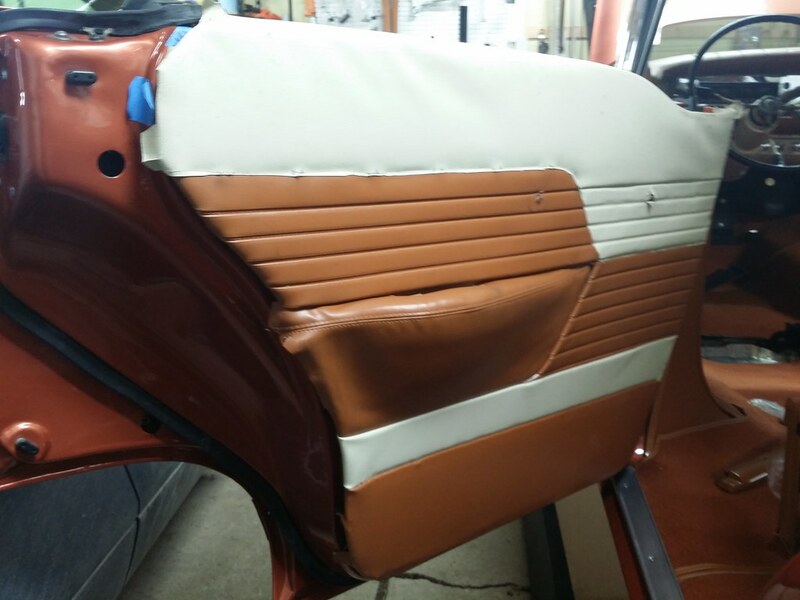 With the seat covers completed, I was able to resume work on the quarter trim panels. 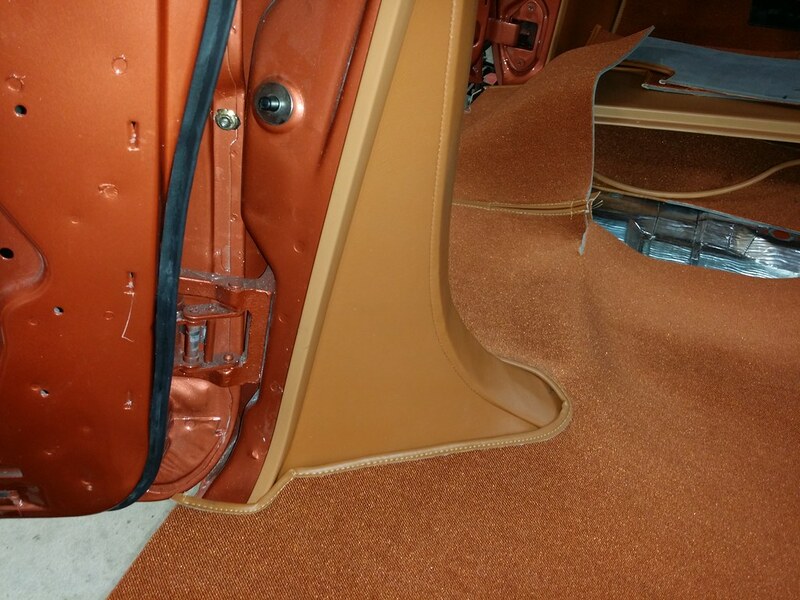 First step was to install the windlace along the rear door openings. 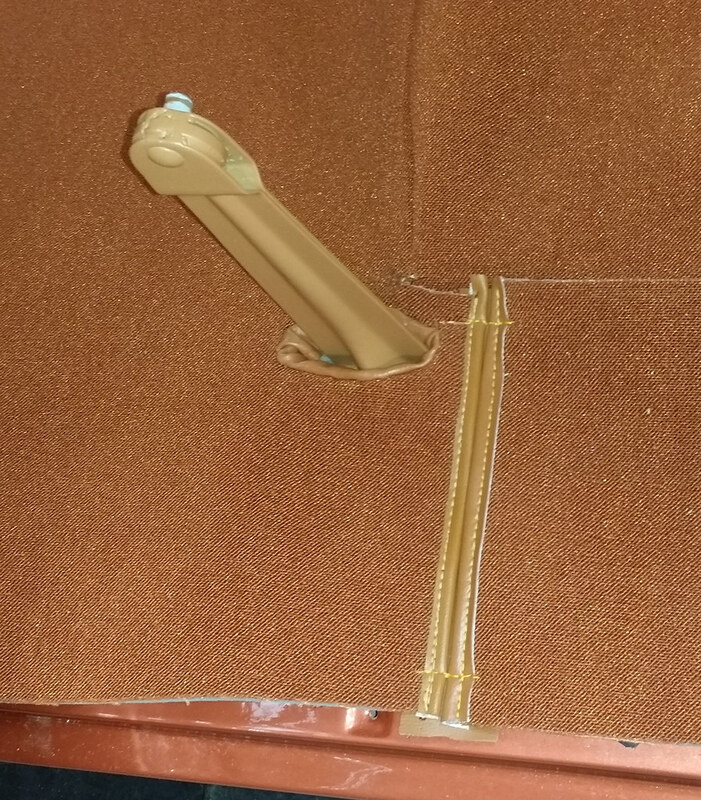 The windlace tucks under the roof rail molding at the upper end and is retained with trim screws to the inner "dog leg". 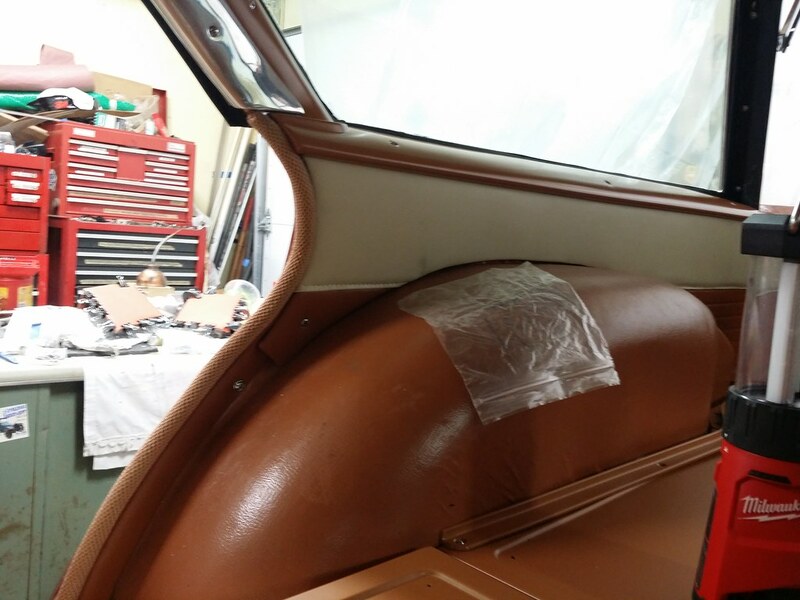 The quarter trim panel - now completed with the decorative deck seam - installs on top of the windlace and is attached with a trim screw to the inner structure. 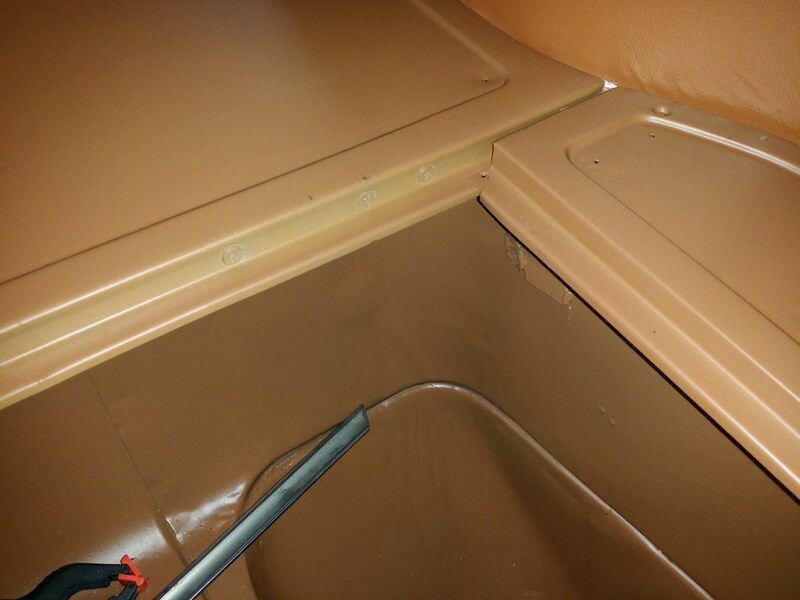 The black line on the water shield indicates where the color split line is positioned on the rear door trim panel. 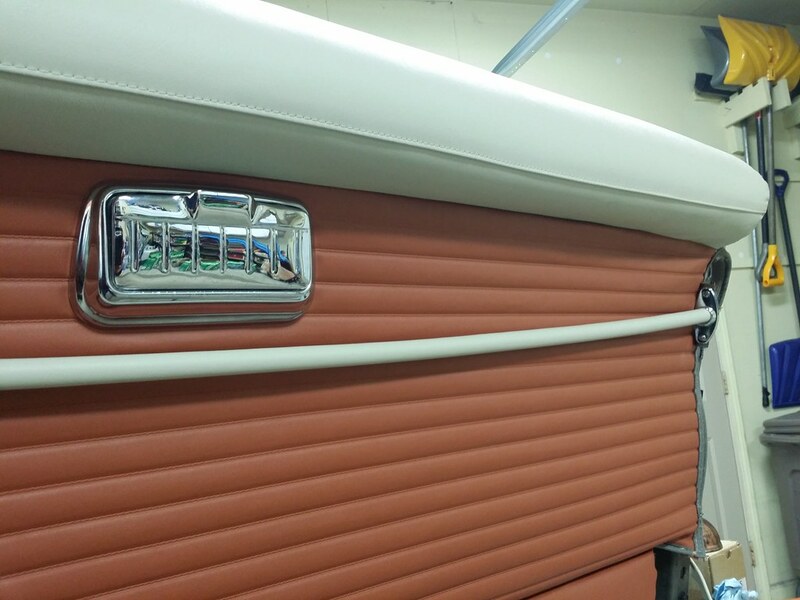 The quarter trim and door trim color split line up perfectly. And then, do it all again on the passenger side! 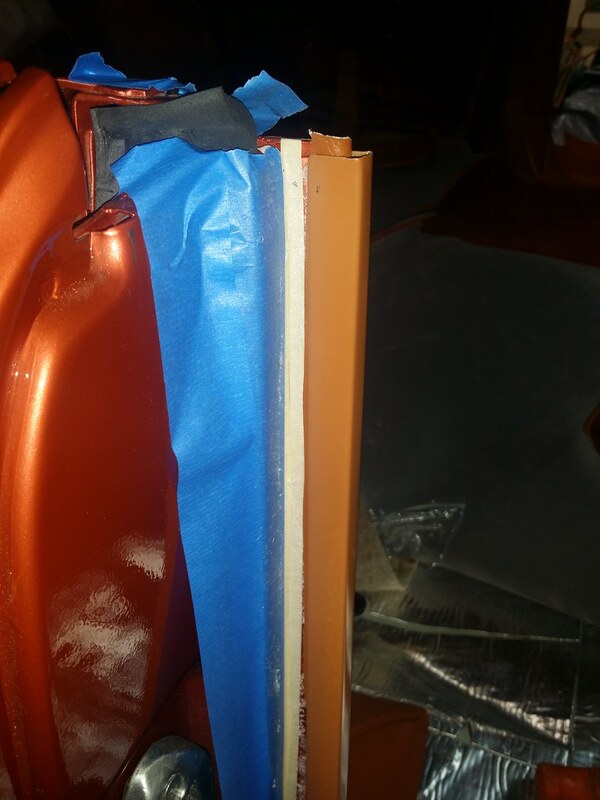 Moving on to the rear door trim installation, I fabricated the water shields from 6 mil poly film instead of coated paper. 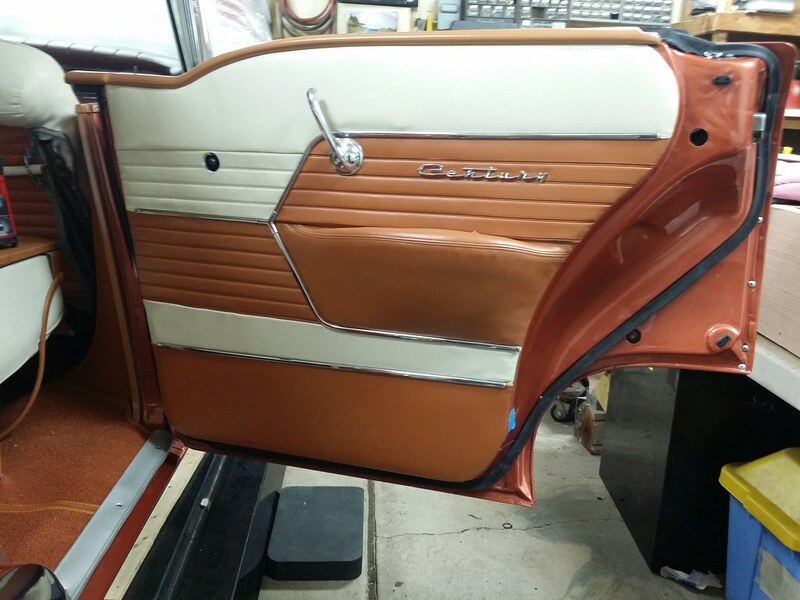 The alignment of the rear door and quarter trim two-tone split turned out nearly perfect. I installed the door handle at the wrong position; another item to add to the list.